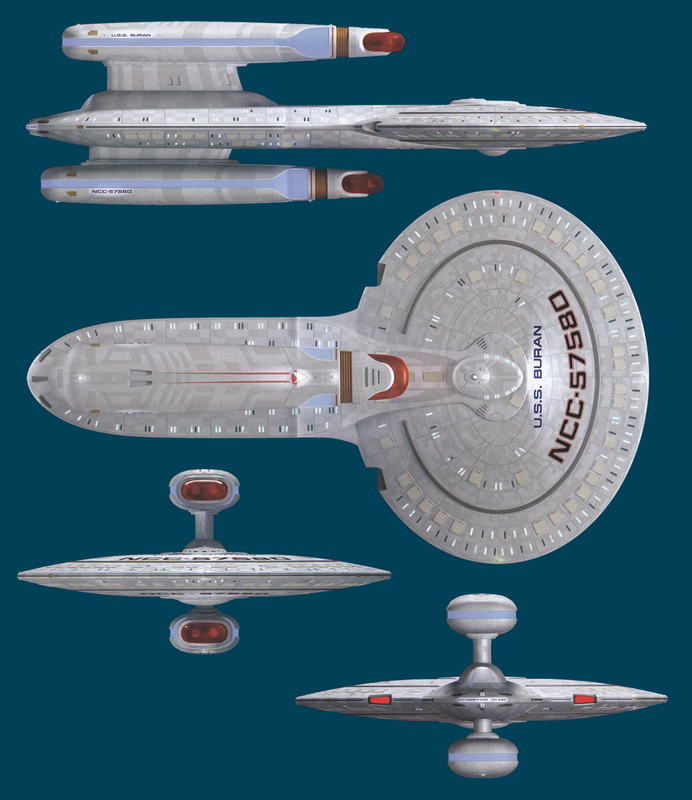 This will be the final Trek update for a while - 7 new designs from Bill "Admiral Buck" Krause and Scott W. Bell. So this is a funny one. As I was digging through my piles of schematics, I ran across a ton of hard copy printouts sent to me back in 2002 by one of the database's early contributors, Jim Morrow, some based on a number of designs that were only originally ever seen in silhouette! I totally forgot about these, and I must publically apologize to Jim for sitting on this so long. Those were pretty crazy years for me back then and sorry to say that particular stack got lost in the shuffle. But there are now 21 new additions to the Federation ships section. Thank you Jim! 21 new additions and 4 updates to Federation ships here. Greetings! Here you will find many new ships along with higher-resolution updates to ships that have existed in the database for quite a long time. 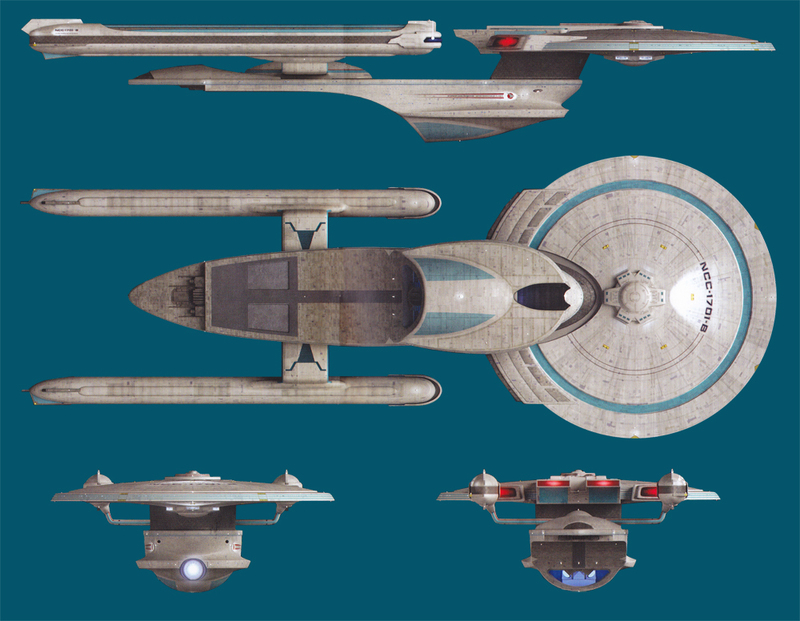 The new ships include a whole new batch of Star Trek Discovery vessels (along with a new section in the database to support that era), primarily Starfleet and Klingon. There will be a few more coming in the ensuing months as I move to clear out my backlog. Thanks to Eaglemoss, this job has gotten considerably easier, and I will add new designs they put out towards the end of the year. This will be a slightly longer-than-normal process, as they are released two ships per month and not all at once in one big bulk release. Checking in for another installment. Apologies that updates seem to be year-at-a-time these days. After having moved cross-country to a new location (and prepping to do a shorter move next year), with much of my resources and materials encased in boxes until the final move, my availability to do updates has been slim, to say the least. I have collected a few in the intervening months which I'm putting out today, while I have the time. I have some new books (in a box somewhere) from Jackill's waiting to be scanned and included, plus some other things. Hopefully next year I will be able to pull everything out and start working on it again for a larger update in time for the SSDB's 20th Anniversary. In the meantime, here are a few new ones to hold you over. After over a year away, I have pulled together some new and interesting designs from various sources. No new ships to report at this time, but rather a functional update to the database GUI that has been long-needed. Since the Star Trek section of the SSDB is so vast - bigger than the other three sections combined - I have added an additional "reverse lookup" feature. For every ship and bibliographical entry, you will see a magnifying glass that looks like this: . Clicking on that magnifying glass will show all ships that come from the same source as the ship that was selected. For example, if you wanted to see all the ships used in Star Trek: First Contact, you would go to the general bibliography, do a browser search for "First Contact" and click on the corresponding magnifying glass. That would then take you to the "Related Ships Reverse-Lookup" page that will display all vessels in First Contact. Hopefully the user community will find this useful when researching and cross-referencing various designs. Additionally, there a few extra Federation and Klingon ships I'm throwing in this release, which will be the last for a while. As I always try to ensure that credit is given where it is due in the thousands of designs that make up the SSDB, every so once in a while I have to make some minor corrections. In this update for January 12, I made some changes to the database credits for various designs attributed to one Don Woligroski (a.k.a. "Cleeve") who has done 3D CG ship design work for various Trek-related video games over the years (SFC, Aramada, etc) that were originally attributed to others. This has been adjusted, along with the addition of a few of Don's other designs that slipped through the cracks. 5 updates to Official Federation designs - Special thanks to "Trebuche Starships" for providing them. 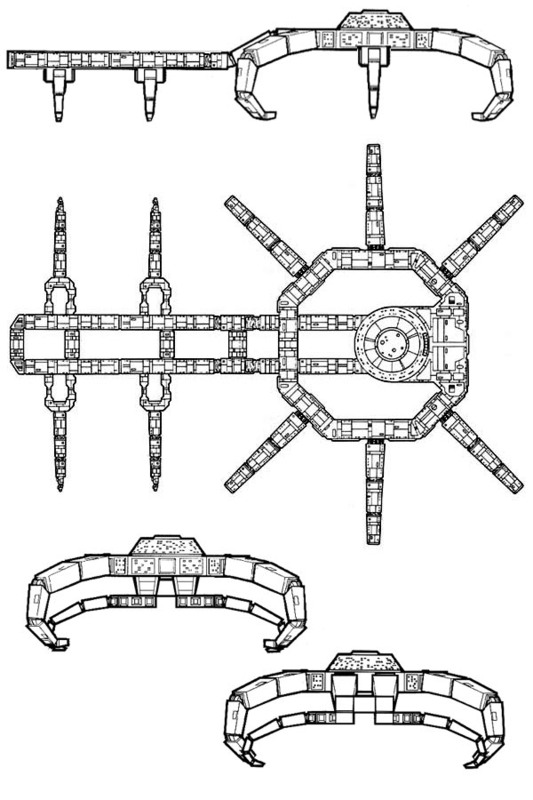 10 updates to Unofficial Federation designs (6 from "Trebuche Starships" with updates based on Starfleet Prototype and Starship Design publications from Starstation Aurora and 4 from John Payne). 9 new Official Federation designs from various contributors. 455 new Unofficial Federation designs from various contributors. 27 new Unofficial Klingon Empire designs (23 from Star Trek Online and 4 from various contributors). 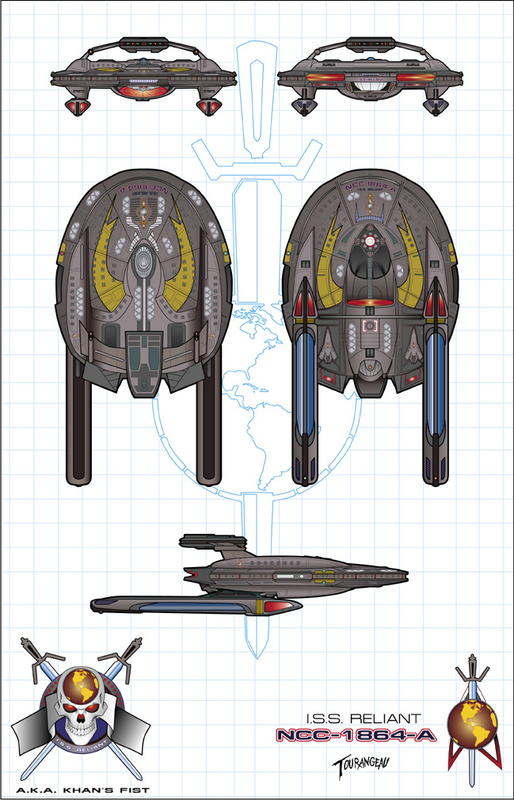 2 new Unofficial Romulan Empire designs from various contributors. 37 new Unofficial Alternate Universe designs (24 from Sean Tourangeau, 12 from Ian Keldon and 1 from Arthur Jackson). 1 new Unofficial Cardassian Union design from Rutger Warrink and Robert J. Wilson. 3 new Unofficial Gorn Defense Force designs from Star Trek Online. 5 new Unofficial Orion Syndicate designs (3 from Star Trek Online and 2 from Ian Keldon). 1 new Unofficial Vulcan Navy design from Star Trek Online. 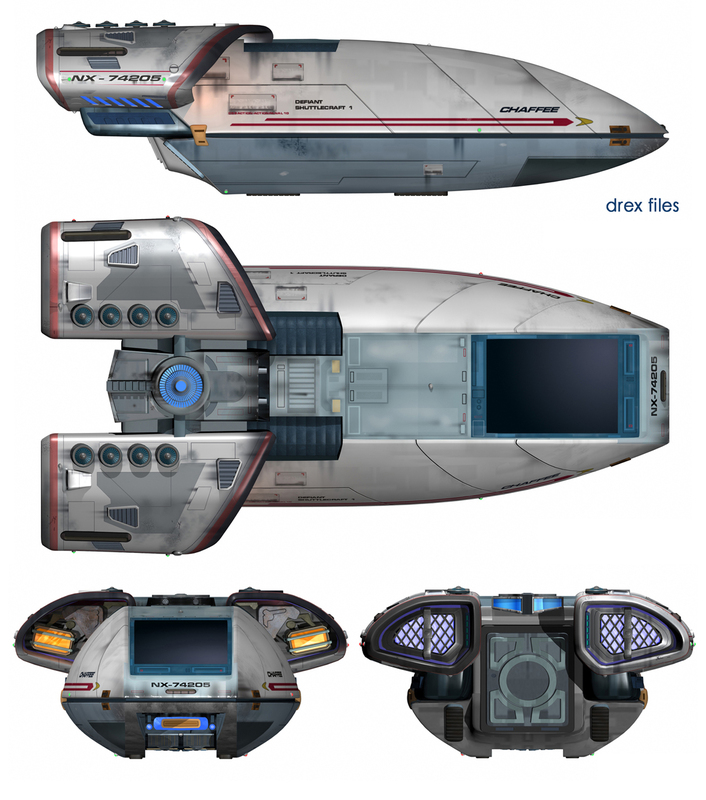 4 new Unofficial Miscellaneous designs from Star Trek Online. 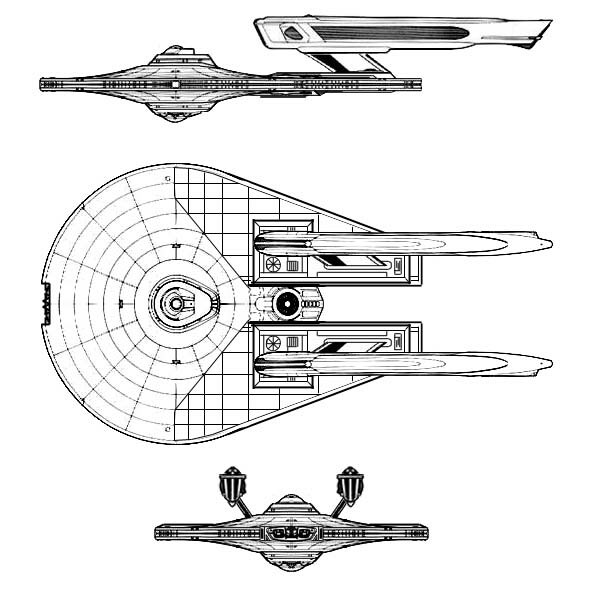 I finally managed to track down an excellent rendering of the official Declaration Class XCV Enterprise (which I'm referring to as the "production model", first seen in the Enterprise recreation room in Star Trek: The Motion Picture. I've had several other versions of this in the database, but none seem to capture the lines of this unique craft until now. Graphics work done by Harry Doddema. 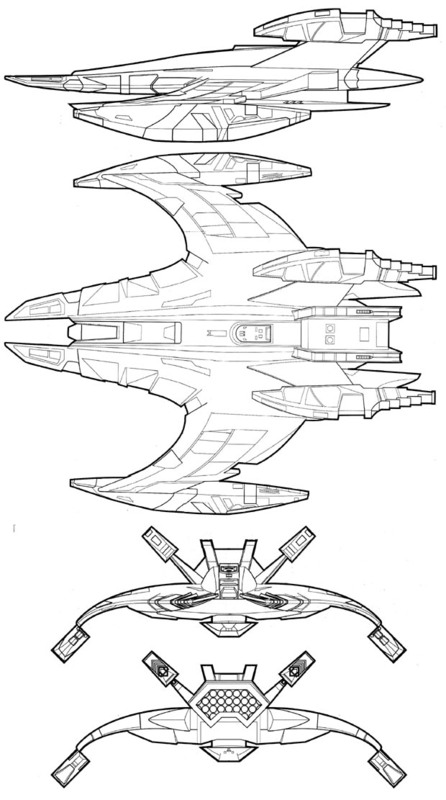 Additionally, the prolific Sean Tourangeu has come up with an experimental variant of his Alternate Universe Kestrel Class Cruiser in the form of the ISS Vengeance. To add to the list of random kitbashes out there on the web, I found this interesting Miranda variant USS Kubrick by Warren Zoell. 22 new Federation designs from Neale "Vance" Davidson. 13 new Federation designs from Brad R. Torgersen. 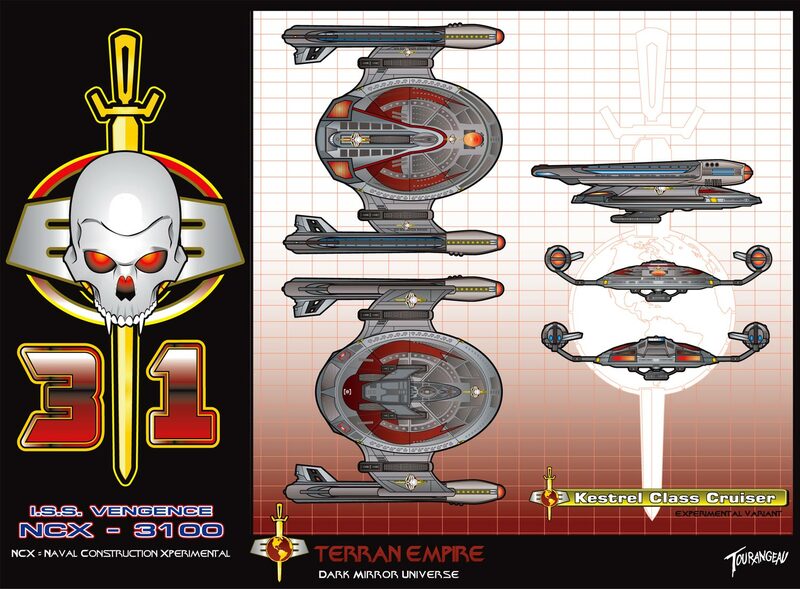 9 new Klingon Empire designs from Brad R. Torgersen. 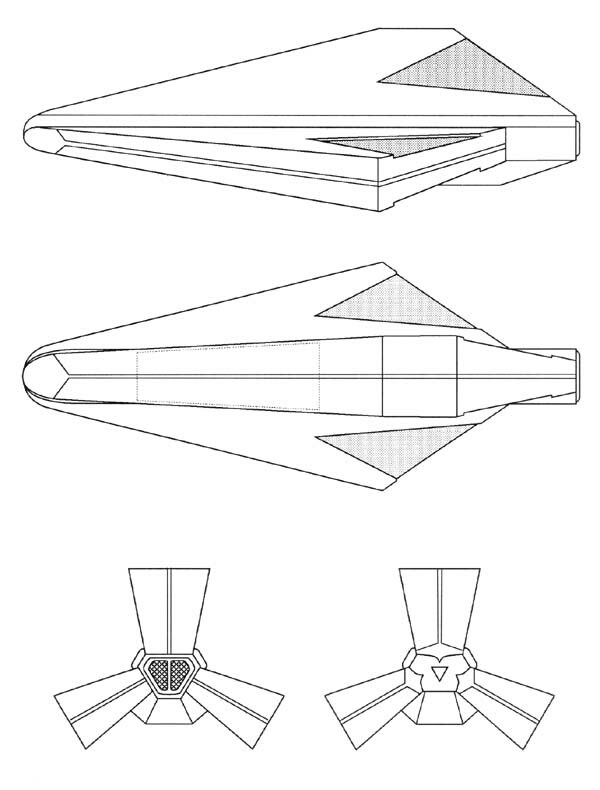 To continue the FASA/SFB genre of ship designs, a large number of Non-Federation designs have been added, originating from the STSTCS. These include a whole new section for the Orion Syndicate, plus designs for the non-caonical, yet extremely interesting, Kinshaya - located in the Non-Aligned Races/Organizaions section. 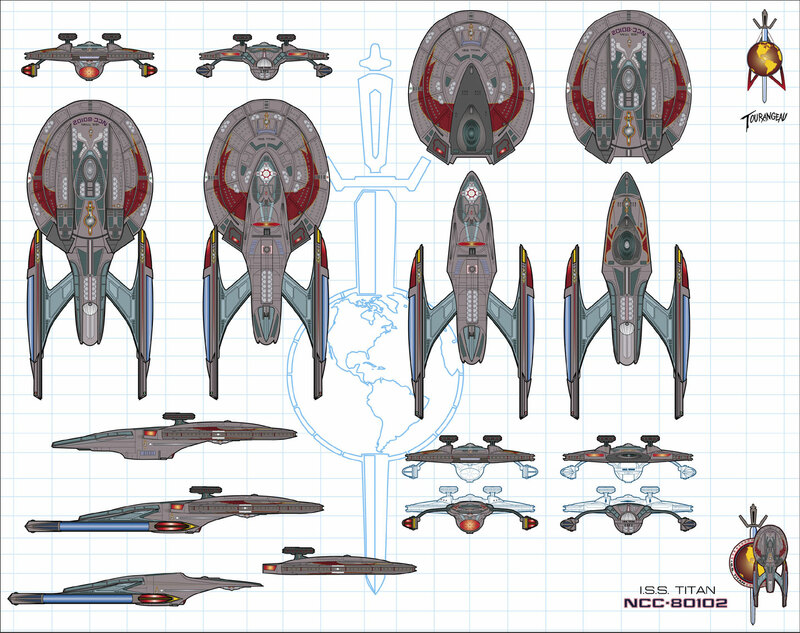 108 more Federation ships if you're a big fan of FASA-related designs from the STSTCS. I also finally tracked down a good version of the canonical Challenger-Class Cruiser, a kitbash ship that was seen off in the distance at the Wolf 359 graveyard in the Star Trek: The Next Generation two-part episode "Best of Both Worlds". There will be a large batch of non-Federation ships coming soon, also from STSTCS. Started playing around with AJAX and built a context-sensitive search when looking for a Federation ship name. Seems to be working fairly well. Some more content updates coming soon! I discovered a few stragglers that I hadn't included in my last few updates from Neale "Vance" Davidson (43, to be precise), which I have included in this latest release, here. 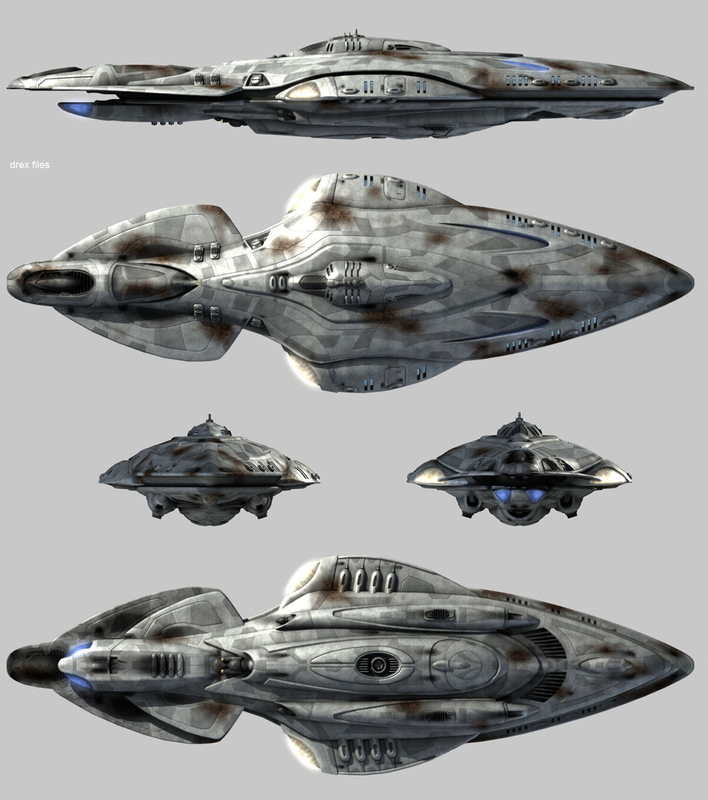 Additionally, I have included the latest design from The Drexfiles, the Xantoran Vessel from the Star Trek: Enterprise episode entitled "The Breach". Finally, I have published the only known schematic (side view) of Spock Prime's Jellyfish Timeship from the new movie. There may be some question if the construction of this vessel was subsidized by the Federation/Starfleet (like the prequel comic mini-series would suggest) or if it was a purely Vulcan construction project. For the time being, I am including the Jellyfish in the Federation section. Hopefully, some more "official" designs will be revealed on this ship in the near future. That's it for now. Starting work on some Battlestar Designs, now. Until next time! Finally, Abramsverse Federation Starships, thanks to Tobias Richter and The Light Works. Still looking for the Kobayashi Maru and the Klingon vessels. As promised, Klingons, Romulans, Vulcans, etc. Welcome back all! This is probably one of the BIGGEST series of additions that the database has seen to date. I guess this is what happens when I wait for 4 years to do an update. So, we have a bunch of stuff that has come out in the past few years. This is a Federation-only update, including official and unofficial submissions, containing both new content and updates for existing content, all meticulously laid out. We have several hundred ships coming in from two of the most prolific ship designers I've ever seen, Dirk Jansen and Neale "Vance" Davidson. We also have a bunch of new official content from Doug Drexler and John Eaves, two main contributors to starship design for the series and movies. Finally, some of you are probably wondering if I'm going to include designs from the new J.J. Abrams movie. The short answer is yes. The long answer is that I need to adjust some code in the database to handle the "Alternate Timeline" in a way that the site was not originally designed to reconcile. I assure you, this will be worked on at a later date. So, that's it for now. I have a bunch of Klingon, Romulan, Vulcan and other designs that will be included in the near future. Thanks much and see you soon! Without further ado, here is the latest update! As mentioned in the main chronology, I have a few stragglers from years past that hadn't made it into my last batch of updates for whatever reason. Some updates on existing ships, others new designs. See them here. Back to some other new stuff. 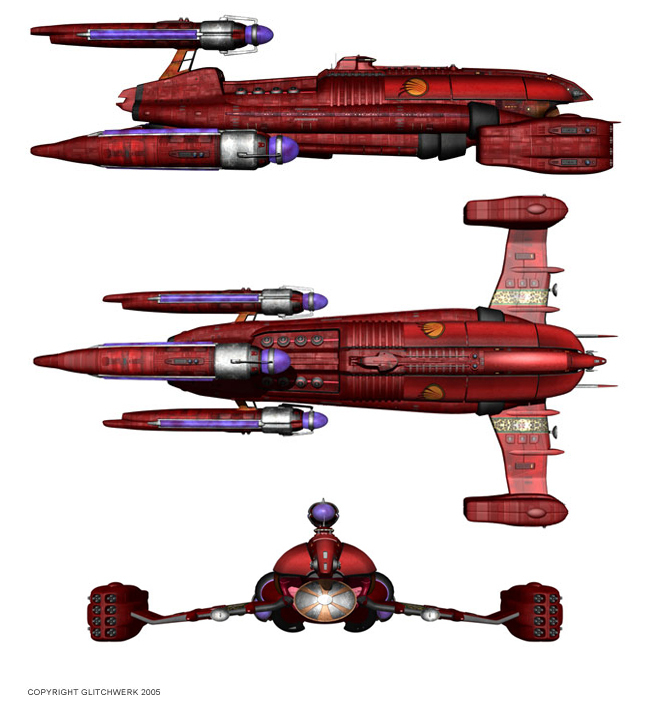 We have one small addition from Aridas Sofia - the Kiaga-class Perimeter Action Vessel. Very nicely done! 42 New Federation ships and 3 updates from Neale "Vance" Davidson, William McKinly, Sean "Titan Designer" Tourangeau and many others added here. 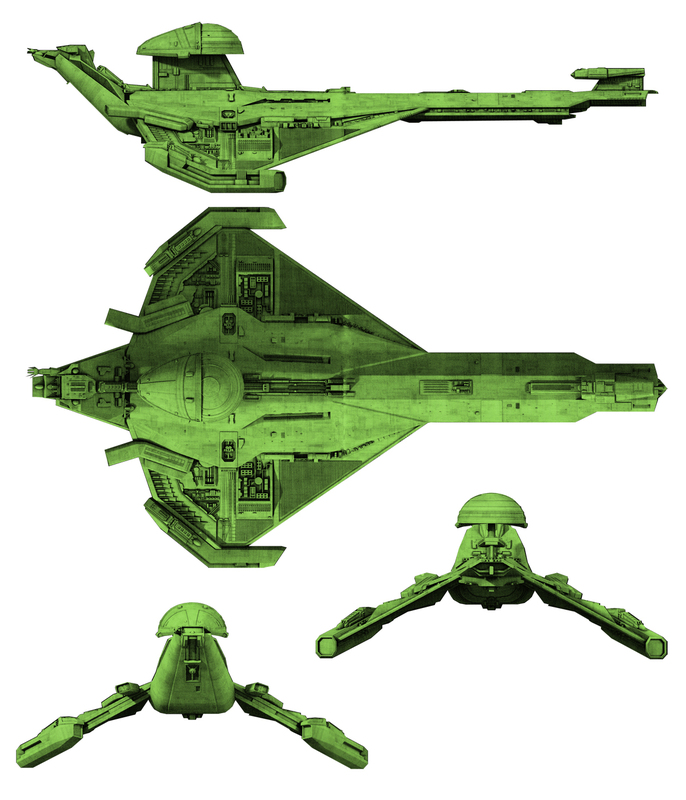 I have also made a recently discovered addition - a conceptual design of a new Kzinti ship, called the Darkstalker, by Glitchwerk, that was to be used in the never-filmed fifth season of Star Trek: Enterprise. 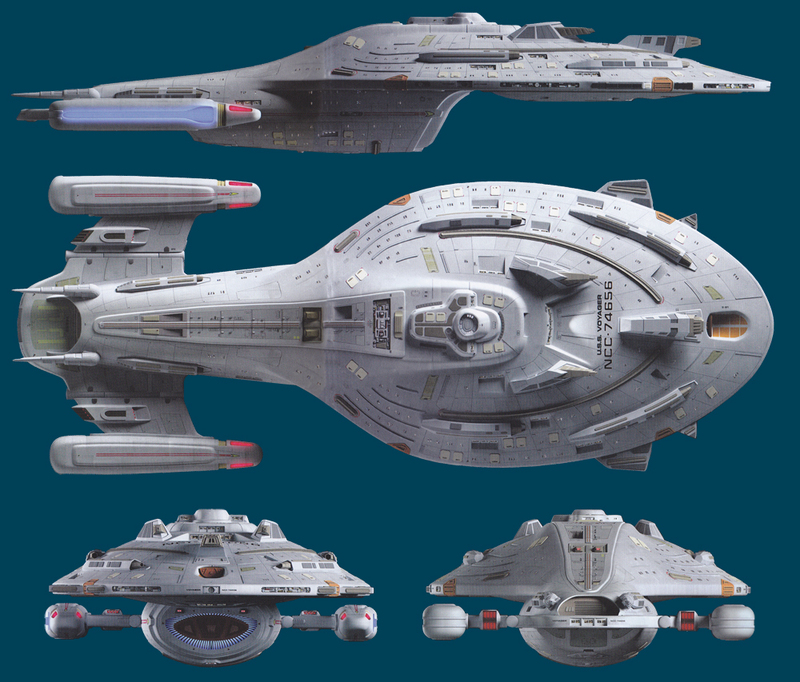 As it was never filmed, it cannot be considered "official", per se, but the discovery of this really cool ship only makes me more irritated that Enterprise was cancelled just when it was starting to get good! Anyway, there it is. This effectively cleans out my Trek backlog now. Finally, as a tip of the hat to what some have called "The best Star Trek movie since the Wrath of Khan", I have lovingly included a new "official" Heavy Cruiser - the NEA Protector - from Galaxy Quest - made by the good folks at The Questarian. 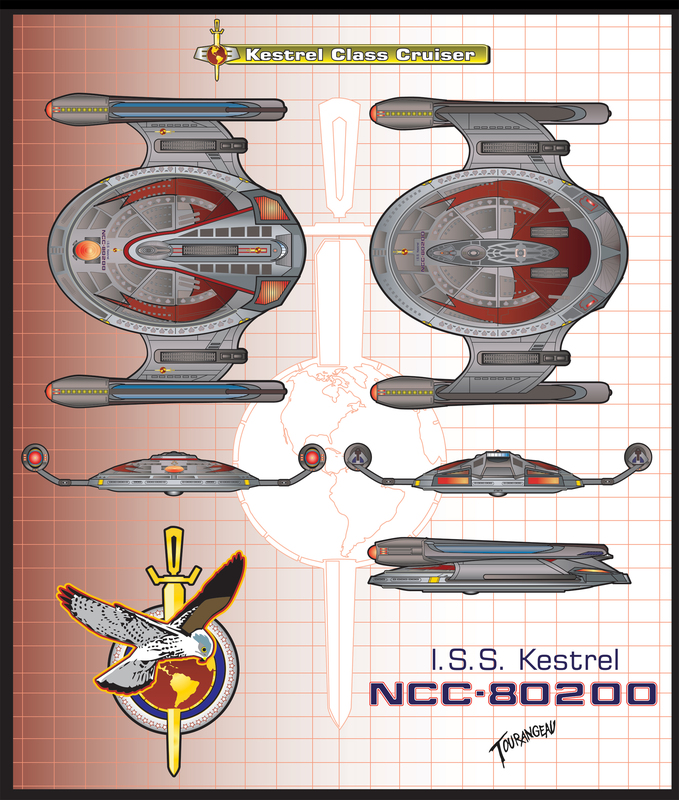 Having perused the web recently, I noticed that Masao Okazaki and The Starfleet Museum have added quite a few new Pre-TOS and early TOS designs for Federation, Klingon and Romulan Empires. I have taken the liberty of assembling them here. Also looking forward to seeing some of Eric "Jackill" Kristiansen's new and revised designs and including them here soon where necessary. On to the pics. suggested that the first warp powered ship was the Bonaventure. "I designed the ship specifically for the calendar. and back. That is why I'm only including a top view. 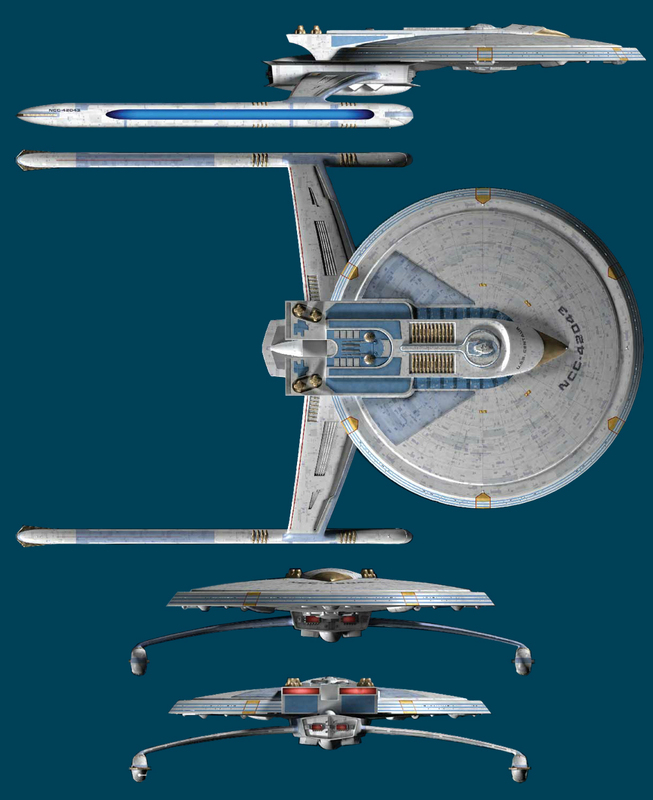 Made updates to Sean Tourangeau's designs, including the USS Titan (the design chosen for the Titan series with Captain Riker) and the Alternate Universe ISS Reliant, a.k.a. "Khan's Fist". 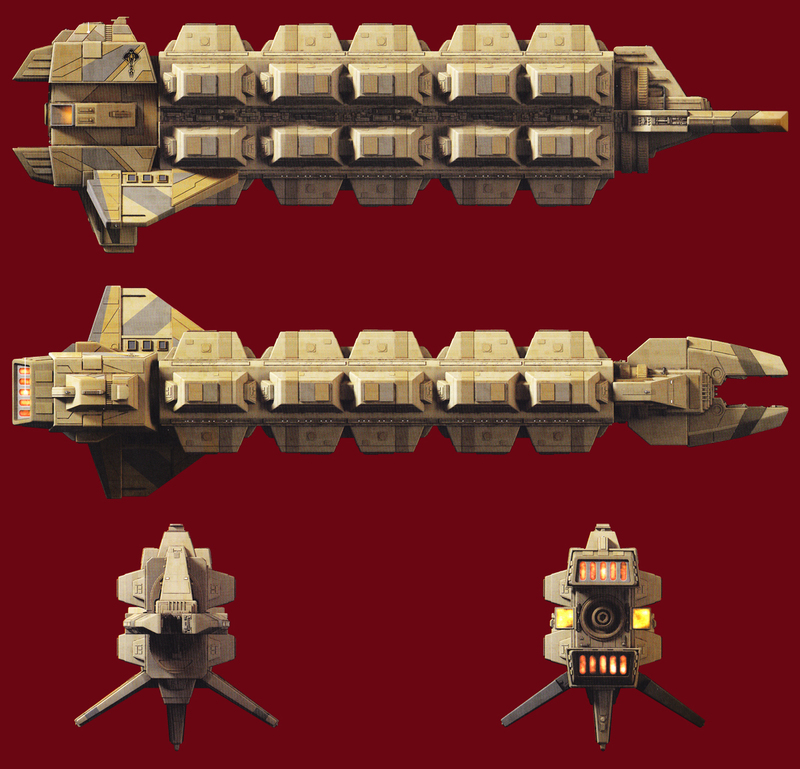 Also added a new Alternate Universe variant of the ISS Titan and the Stingray Class Heavy Destroyer ISS Icarus. Thanks, Sean, for these great designs and updates! For the final day of February, the FINAL mass Star Trek update. 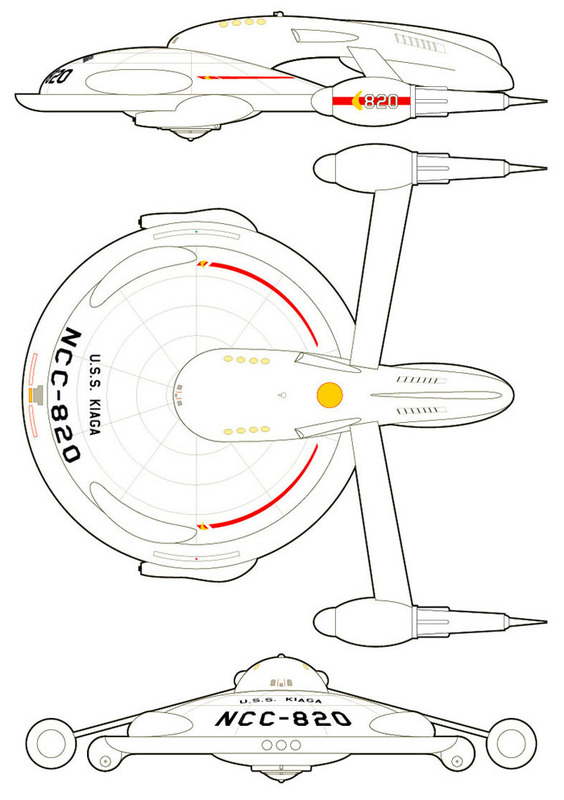 With this update, the Star Trek section, by itself, has exceded 2000 schematics (2237 to be precise). Not a bad count. As a reminder, I will not be accepting any new designs in the database. From this point forward, I will restrict updates to the occasional official schematic I may come across, or some fan-made thing that is simply too cool to overlook - at my discretion. 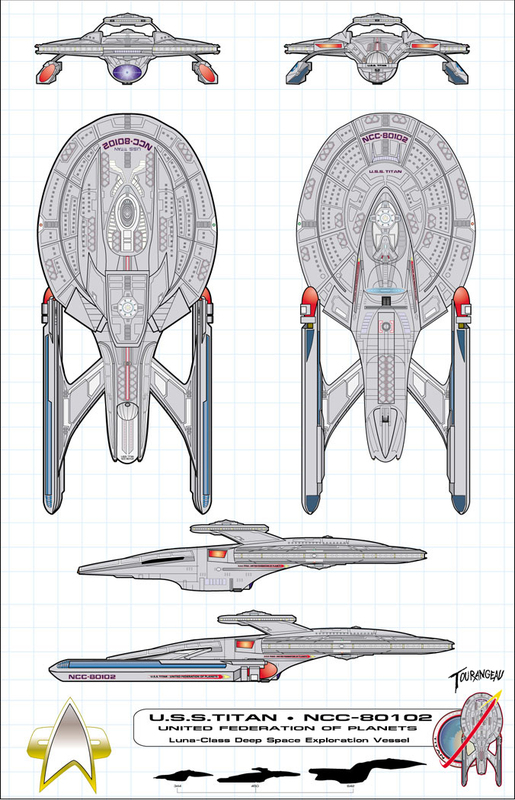 Here's another Federation-only update which completes my "scanned" schematics. I will now begin the task of going through the enormous backlog of user-submitted designs and asseble that final batch. This will take a while. In the meantime, Here are the new ships. WOW! It has been only 8 days short of four years since my last update. Time has flown! In any case, apologies for the delay. This is the First of the Last. That is to say, this is the first update in a batch of many that will be the last mass updates for the SSDB, as I have mentioned in the primary Chronology. I know you all have been waiting long enough, so I'll shut up now. Click here for the latest and greatest. Well, as you all know, things have been pretty rough. I lost the server I was using for the database, I've experienced hard drive outages and email breakdowns resulting in data loss, and I have lost some schematics that were sent out, unfortunately. However, I was able to preserve about 95% of what I had in my archives. I have now effectively exhausted what I had remaining in the queue and placed it in the database for all too see. The update is in the official release for today. I will now be focusing on going through my Star Fleet Fact Files and scanning in the backlog of official designs that I've built-up over the past year-and-a-half. I have a few other books to scan in (DS9 Tech Manual, etc) and will be updating those within the next month or two. 81 more Federation designs have been added do the database from various artists. This marks the finish of my big backlog of starships and submissions from the days of yore! I have a few new ones that I've recently obtained in my queue, but they will not be addressed for a while. I'd like to move into the Yamato and B5 sections, now, for which I've received many requests. It is time for that to happen! There may be the occasional Star Trek update, but not much until the other remaining "under construction" sections are fleshed out. We're in the home stretch! 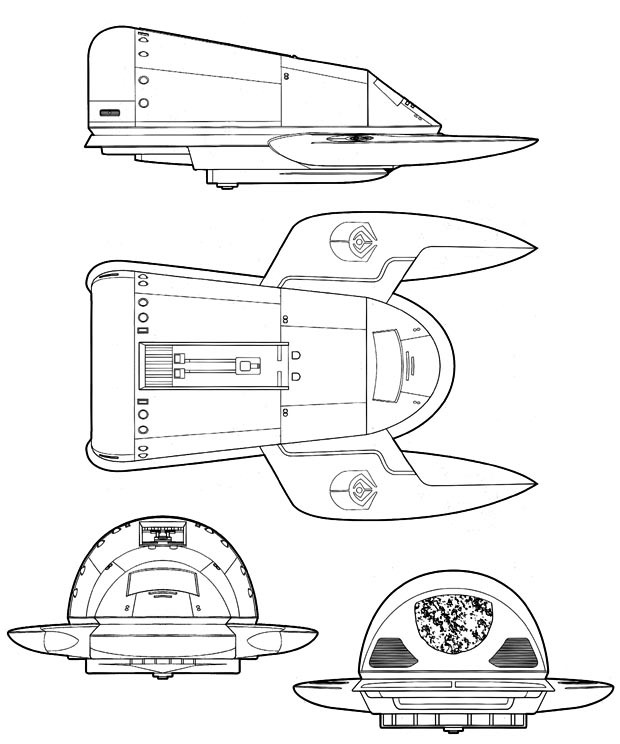 Nine more groups of ship designs have been added from Martin Higgs, Metropolis Art Gallery, Raymond Anders, Russell Nel, Sci-Fi Art, "Sciphen", Thomas M. Gorman, David Underwood, and some Pre-TOS designs taken from the old Spaceflight Chronology book from 1980. Five more groups of ship designs have been added from Bernd Schneider and Ex Astris Scientia, David Underwood, Eric "Soundwave", John Payne, and Marco Kaas. 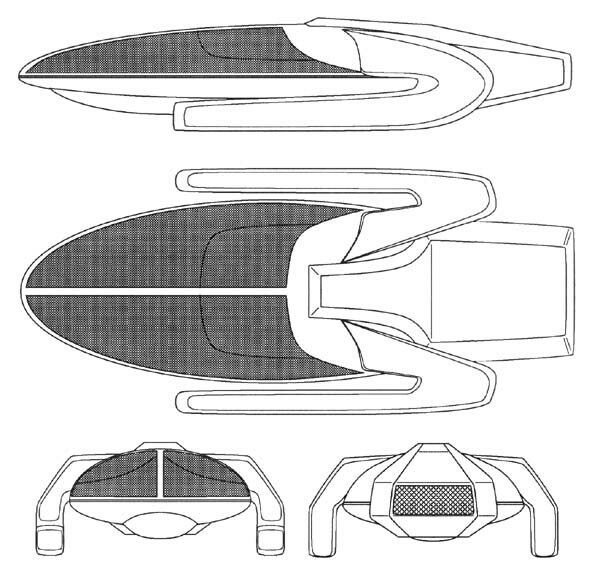 Three more groups of ship designs have been added from Masao Okazaki and The Starfleet Museum, The Advanced Starship Design Bureau, and Barrie Ward. Well, another year has flown by. Many designs piled up in my hard drives, and I'm now just starting to get them placed in the database. I just simply got tired of the things bogging me down (along with the emails asking if I died!) Many apologies for not doing more regular updates, but I've gone this path before. those who have talked to me via email in the past know why. In any case, be prepared for over 360 Federation designs to be released within the next couple weeks! And you wondered what I've been spending all my time on, recently... Here's the first installment - a series of new ships from Festus and James P. Beery's Biraktes Shipyards. As I have so many designs in the queue, I'll be releasing them in groups, sorted by submitter. I figure that way would be the easiest. Also, to cut down on the extreme length of this Chronology page, I'm starting to put all the newest designs in their own date-based file. In this case, click HERE to see the latest stuff. Happy New Year, everyone! I know it's been a LONG wait...for some, longer than others...we'll get into that farther down, but I'm hoping it'll be worth it. 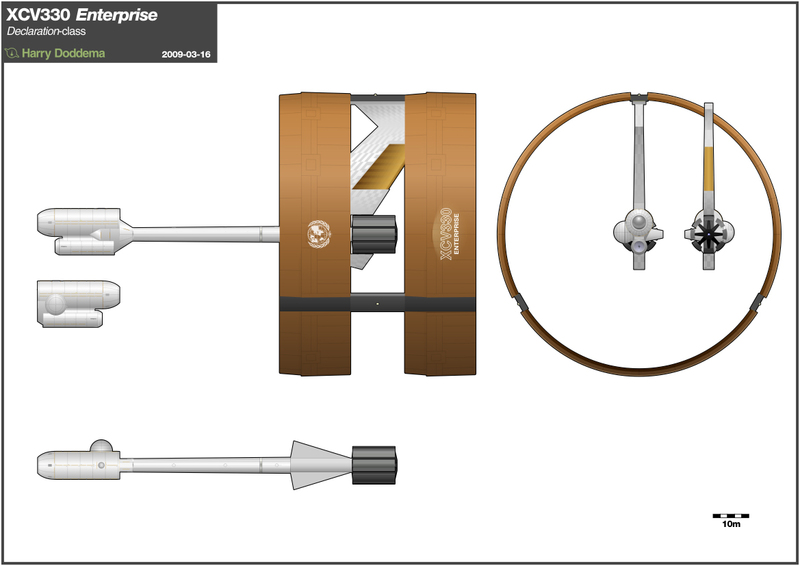 This first installation of new designs for the milleneal year are updates (and new submissions) of a large number of official designs, including schematics for all the vessels appearing in Star Trek: Insurrection. I've subscribed to Paramount's official Star Trek Fact Files (imported from Europe) and the Official Magazine (local here in America). Many of these publications have incredibly detailed and accurate schematics on designs I've only been able to duplicate with a VCR, a remote control, and Adobe PhotoShop. After seeing the real stuff, I'm proud to say I wasn't far off on most of my personal designs, but it's nice to finally have something that can be called "official". The second planned release (planned within the next month, or so) will be the kick-off of the new Battlestar Galactica schematics section, which I have put off for a long time, and I think that time has now finally come. There aren't that many to begin with; the biggest challenge will be coming up with a web interface that captures the Colonial "environment", in keeping with the other interfaces I've built for this site. Added new and updated Official designs. After a long hiatus of moving into a new townhouse and starting up a business, I've found the time to push out a large chunk of the backlog of starship designs I've been collecting over the past six months. There are more, to be sure. I'll be updating a large number of my official designs, among other things. We're back! Please refer to the Main Chronology for a low-down on what's been going on. Pretty soon, I'll be adding some new Trek designs which will be showcased here upon completion as soon as I get them finished. IMPORTANT NEWS: There is the possibility that in the very near future, the site is going to go down to be moved to a new location. There is no telling when it will be back up again, so my official word on this at present is an indefinite outage. As one of my favorite authors would say, however, DON'T PANIC! I'm not disappearing off the face of the earth, and Paramount hasn't stomped me into fine granules. This is merely a technical issue only. Hopefully, there will be plenty of time for this update to circulate and let enough people know about this turn of events. Consequently, any whiny emails asking where the site went will go unanswered! I've grown quite weary of such mindless correspondence in the past year. I will, however, continue to receive legitimate emails regarding starship design and submissions, as well as make plans for the new Battlestar Galactica section. Until that time, please sit tight, be patient and be well. In other news, there's a new game in town (if it can be called a game?) -- Star Trek: Starship Creator from Simon and Schuster. It appears to be a starship designer's dream. Build your own ships and put them in their own missions, running in the background. Almost like a Sim-Trek kind-of thing. Don't know if it will be as extensive as Star Trek TNG: The Birth of the Federation from MicroProse (that one sounds more like a Civ II in the Star Trek Universe). The reason I'm particularly interested in this one, is because it's the first piece of software ever made commercially which is 100% dedicated to starship design and development. It's also being made for the Macintosh, as well as the PC, which makes me happy :-) More on that later in the form of a review. In addendum to my October 1 update, I have added a small, yet significant change to the database. 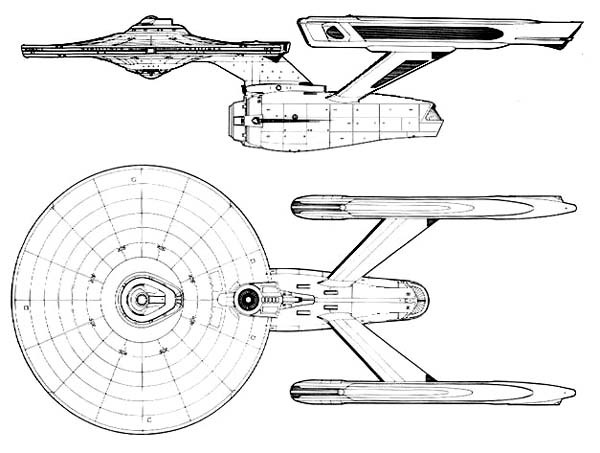 Thanks to Mark Starling and user "Starship Voyager", I finally obtained a copy of the official schematics to the U.S.S. Prometheus from the Voyager episode "Message in a Bottle". It was taken from the mysterious non-American Star Trek Fact Files, to which I am currently trying to get an international subscription. Wish me luck. This one's much sleeker than my original rendition...I like it! Enjoy. First of all, the site just broke 50,000 users today at exactly 18:57 (6:57 PM) Eastern Standard Time with a hit from Joseph Richter! Many thanks go to Joseph and all the many other users of the database to make it one of the most popular fan-run Trek sites on the 'Web. Second, not only did the database break 1,000 schematics, it broke 1,100! I've been procuring a number of designs with the hope that I could time their release with the 50,000th hit, and I'm happy to say it went off without a hitch. Thanks go to my regular submitters, including James P. Beery, Eric C. Fahrner, Adam Heinbuch, Bobby Jones, Jim Leary, Toni Pienonen, P.T. Riley, Bernd Schneider, Rutger Warrink and all the hundreds of other site users for giving the database just the boost it needed to kick it over the top. Third, by EXTREMELY popular demand, I have added ships from the Vulcan Navy, going as far back as the T'Plana Hath Warp Ship from Star Trek: First Contact, up to the T'Pau from TNG's "Unification" Two-Parter. This brings me to a debate that's been going on via the internet for the past month or so. 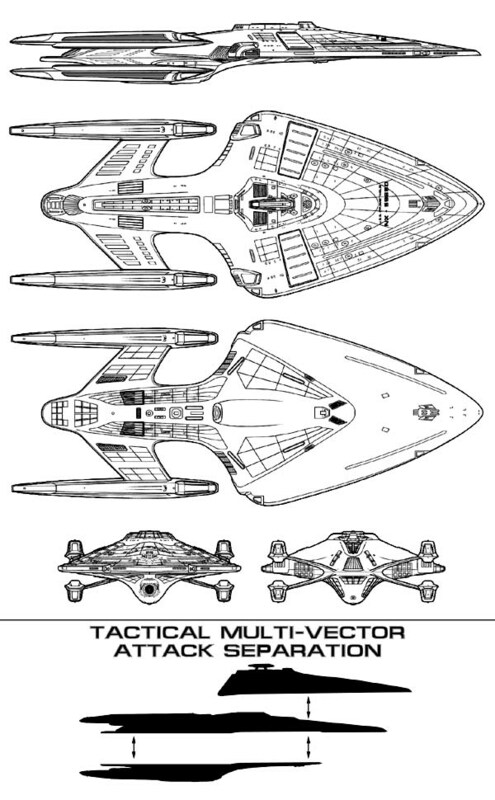 I have been told by numerous sources that the Vulcan T'Pau-class Cruiser in fact belongs to the officially-named (and rather unconventionally-designed) Apollo-class Cruiser in the Star Trek Encyclopedia (Second Edition). I have been told that a direct correspondence exists between these two vessels. Y'know what? It's true. 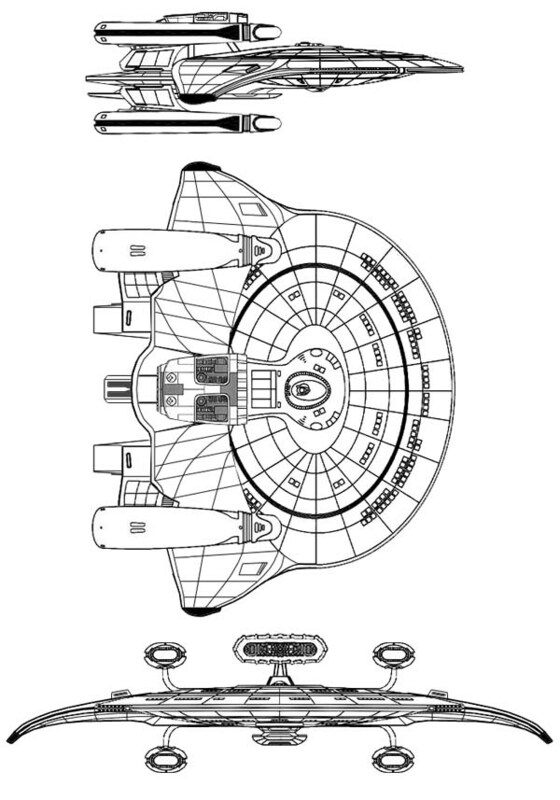 If you have the Encyclopedia, on page 475, you will see the T'Pau registered in the starship listing as a member of the Apollo-class, which has been accordingly updated as being the official design for that vessel. Fourth, and possibly most significant, I have registered the domain WWW.SHIPSCHEMATICS.NET for the database. I figured it was that one last thing that needed to be done in order to make this a full-blown quality site. The "destroyer" address will still work, but if local addresses/servers ever need to change, using the new domain name will (or, at the very least, should) make such a change appear seamless to the web user. Please make a note of it. 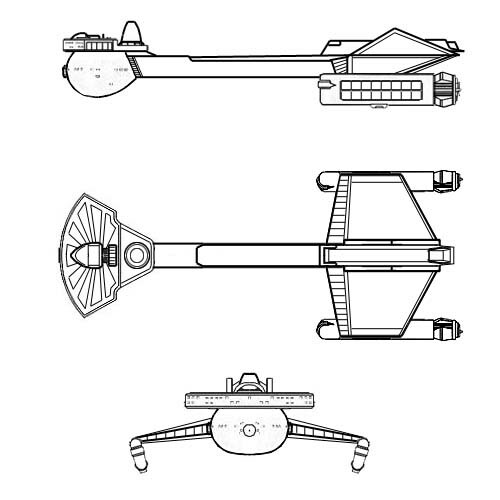 From Gerard Gillan, we at last have the OFFICIAL schematic of the Freedom-class scout as seen in the distance in TNG's "Best of Both Worlds" 2-parter. How do I know it's official? It came from Paramount's foreign-release magazine Star Trek Fact Files which is not available in the United States! Why, you ask? Beats the h*ll outta me! I've found it available in England, Scotland, Germany (and other German speaking countries), Australia and New Zealand. 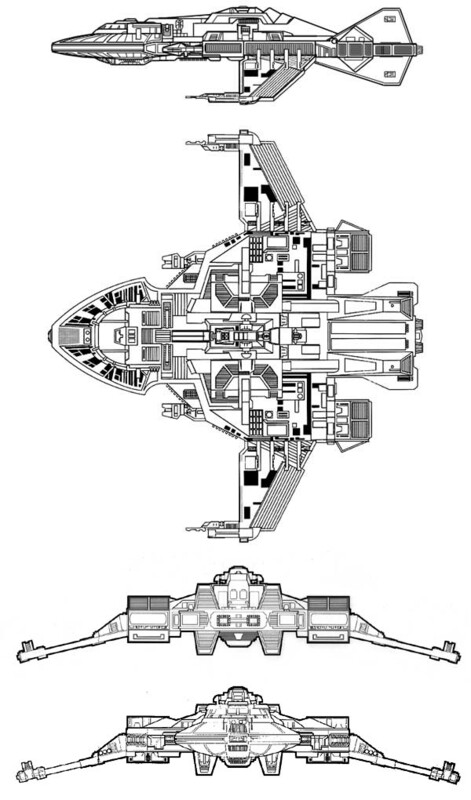 There is also an official schematic of the Prometheus that I hope to get my hands on, soon, to replace (or at the very least update) the one I did for accuracy's sake. 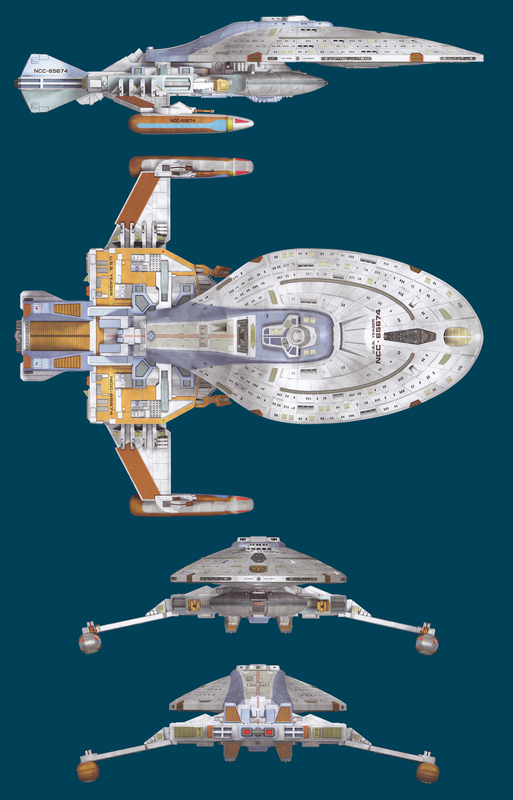 From Adam Heinbuch, we have a fantastic high-detail rendered version of the Pre-TOS Daedalus-class Cruiser. 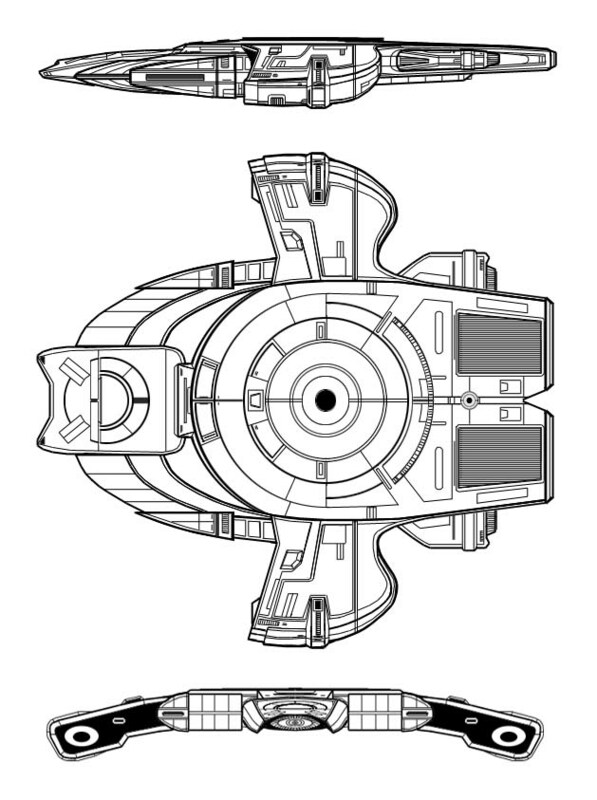 And from Craig Hanus, we have an updated Type 10 ShuttlePod from the DS9 episode "The Sound of Her Voice". Hey, all. Sorry for the down-time. I realized recently that it'll probably take more than just a month to get around to rebuilding the server, so I decided that it would be in everybody's best interests if I brought the database back on its feet again. I have made special arrangements with the system administrators of this machine to enable me to reboot it if the site goes south again. I will be making periodic updates to the Chronology section, so keep watching. I WILL be taking down the site at some point in the near future to rebuild the server - so BE WARNED!. In the meantime, go back to enjoying the schematics. In other news: I have registered this site with InterNic, and will be creating a new domain specifically to this database. Keep watching for details on that one. AND! I've had a large number of emails requesting a Vulcan section. As they have so few ships associated with the Vulcans, and as I have received these emails, I WILL be including the Vulcans in the next release in a few weeks, along with a pile of new Federation and Klingon designs. We're getting close to two milestones with this site: 1) Reaching the 50,000 user mark, and 2) Reaching the 1,000 ship schematic mark. I hope to make those two events happen simultaneously, so keep the designs coming! Got a few Federation leftovers which needed including, such as the America-class Battleship from Entente Systems and the much sought-after Timeship Aeon from the 29th Century, as introduced in the Voyager episodes "Future's End" Parts I and II. In the Klingon section, I've added the Freighter owned by the House Noggra from the DS9 episode "Sons of Mogh". Anybody got an official name on this one? In the Klingon section we have two new ships, the I.K.V. Hood from Jim Leary (which has an interesting story behind it, included in the image), and the Bat'Leth-class Dreadnaught from USS Dark Star. The Romulan section has the new Aerv-class Drydock from Toni Pienonen. 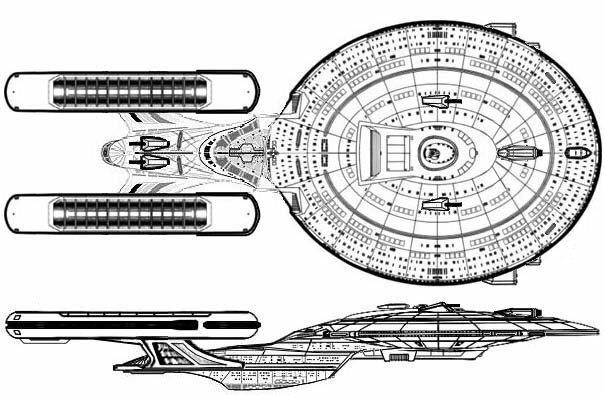 ...And last but not least, the Nemesis-class Galaxy Conquest Vessel in the Alternate Universe section from Erik Fromme. I'm back with a few more Federation additions, including some official dock and station designs. Many thanks to Adam Heinbuch for reminding me about Space Station (Drydock) McKinley (of the Utopia-class) and the Antares Shipyards Drydock from Star Trek: Generations. Thanks to Toni Pienonen for passing the name of that drydock on to me for the database. Small Craft includes all fighters, shuttles, work bees, and any other smaller-than-starship vehicles. This line gets fuzzy with Runabouts, as I have heard people claim they are considered starships, because of the "NCC" designation in their registry. I personally disagree, as I have some other shuttle-type designs in the database with "NCC" registries as well. To me, Runabouts are just oversized shuttlecraft and will be treated as such for the purposes of this database. 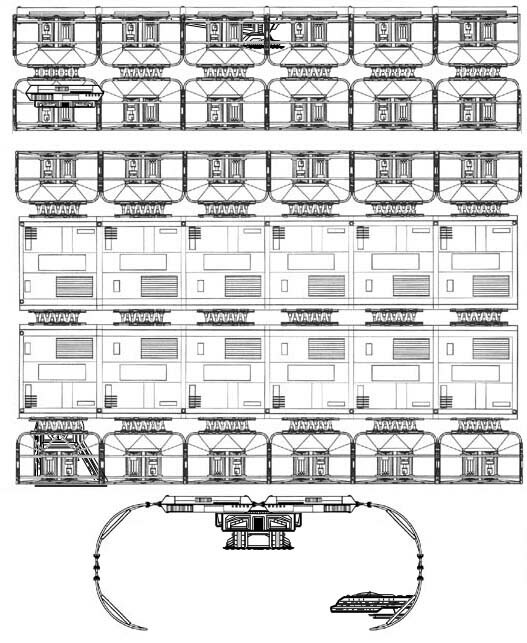 Docks/Stations includes all spacedocks, drydocks, and space stations of any available type. Let me know if I missed anything, but I think I got just about everything. Anyway, there it is! The interfaces have been accordingly changed to accommodate the new configuration. I may do a few small updates here and there down the road, but I think it's time for another vacation away from the site. I will be answering emails and collecting new designs as usual, but I don't suspect I'll be making any more major updates (such as the Small Craft and Docks/Stations sections) for a while. In the meantime, enjoy the new stuff! See ya! Welcome back everyone! I'm almost ready to install the new Small Craft and Stations/Docks sections. I still need to do a little more work with the interfaces to accommodate the new sections. In the meantime, I have taken the liberty of collecting a few more new starship designs for display, including the long sought-after official Merchantman-class Cargo Freighter from Star Trek III: The Search for Spock. Romulan Update! 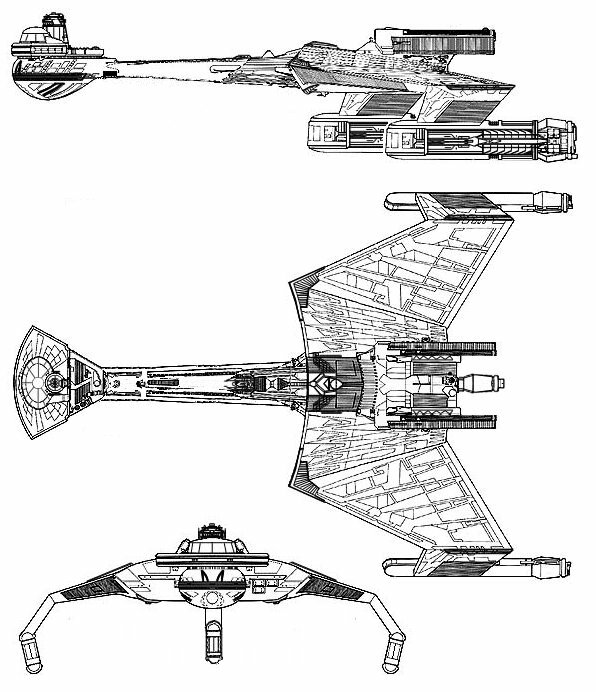 Discovered that the Romulan warp shuttle as seen in the DS9 episode "In the Pale Moonlight" is called a Raptor-class warp shuttle. Thanks to my users for this information. Cardassian Update! 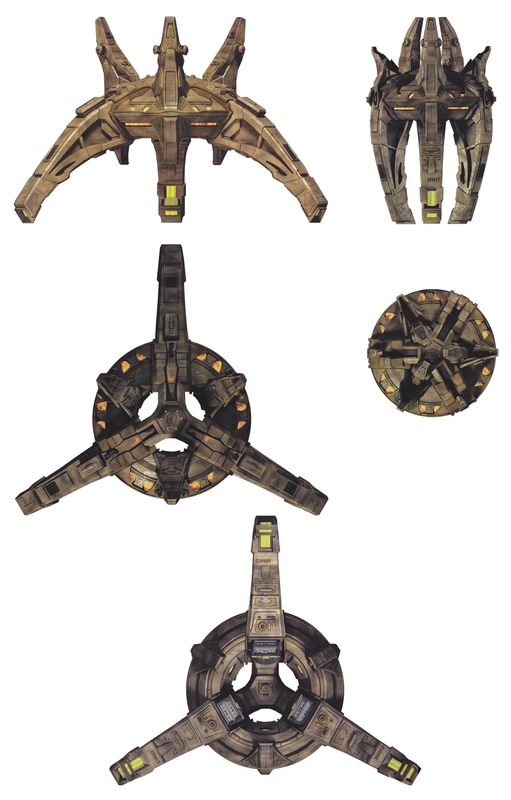 My loyal users have also informed me that my image of the Cardassian Freighter Groumall was, in fact, upside-down! 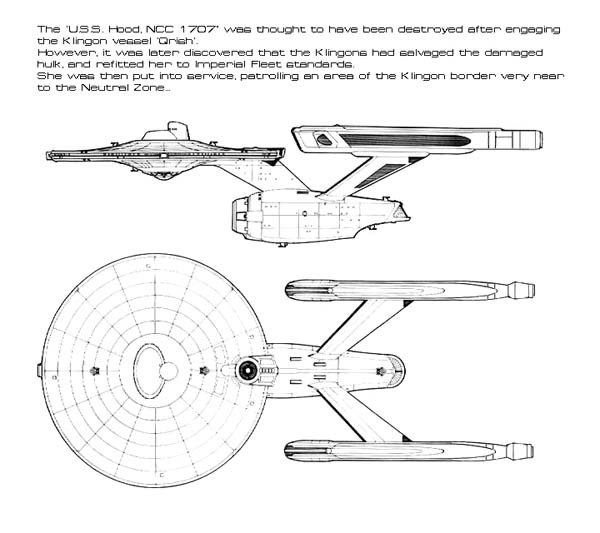 That's because I scanned it from the Star Trek Encyclopedia, which is what had it upside-down to begin with (along with the Jem'Hadar Battlecruiser). Even though there really is no such thing as upside-down in space, I decided, nonetheless, to flip it vertically to match the orientation of the studio model. I have also included a view of the much asked-for Cardassian Weapons Platform from the DS9 season finale "Tears of the Prophets". As nobody really knows if this thing has a class-name associated with it, it will be listed as "Unknown" for now. Tholian Update! Added the new Tholian Light Fighter. Gorn Update! Added the new Gorn Light Fighter. Well, it would appear that the worst thing that can happen to a person with a computer happened to me on Saturday morning. What would have been an otherwise normal weekend turned into a complete nightmare. I was in the process of composing the last few remaining starship designs for the newest release, when I fell prey to an unprecedented hard drive failure on my removable disk. I consider it unprecedented, because in all my seventeen years of computing, I have never experienced such a complete failure of hardware and software. I tried doing a simple file search for a particular file (an existing schematic which was similar to a newer one that was recently submitted), and I wanted to cut and paste pieces from it to create the new schematic. Pretty basic, eh? Well, when the system began searching on my removable media (where all my Web-related data was stored - FIVE YEAR'S WORTH), the system hung irretrievably. I hit the reset button, only to find that upon rebooting, some bizarre read-write cycle began when the removable drive tried mounting to the desktop. Thinking it was just some way of fixing itself, I let it do its thing and went to watch TV for 40 minutes, only to return to a still-spinning disk. I couldn't escape out of the cycle, so I - regretfully - hit the reset button again. This time, the thing wouldn't even mount. It was COMPLETELY hosed! So, I pulled Old Faithful off the shelf and blew off the dust: Norton's Utilities to the rescue! I succeeded in fixing the Boot Sector, but the File Allocation Table was totally trashed. After finally being able to mount the disk, I saw ZERO FILES visible!!?!? Again, bringing up the Norton's Utilities, I went to the Undeleter, where I successfully retrieved 80% of the 4000+ (hidden) files I lost, but with a catch: Since the Directory Tree was fried, every single file was labeled with some strange compu-speak nomenclature, like "JPEG #2183.data", or "GIF #2112.data". I spent the rest of the weekend going through each and every file to see how it should be named, where it should be placed, or even if it survived the whole process altogether. Imagine a castle which has just been blown away by cannon-fire. 80% of the stones are laying about your feet, and not a single stone sits on top of any other stone. That was the task I had to overcome. Needless to say, I had to take down this site temporarily to make a new backup of my web data, taking advantage of full bandwidth capabilities. What was originally intended to be my backup (the removable hard-drive), wound up relying on my originals on the web for backup. Savor the irony. In any case, the site is back up and running, as is my system. I am going to invest in a new CD-ROM cutter to minimize the pain if this ever happens again. I was planning on making my new release this week, but due to the technical difficulties, I'm going to have to postpone that release for another few weeks, as my window for such opportunity has become quite slim. Thank you for your patience, and I'll get back to you soon. PLEASE DO NOT SEND ME AN EMAIL SAYING THE SERVER IS DOWN! Sometimes this happens, be it a full swap disk, or a web server crash, etc. etc. I check the site periodically almost every day, to verify the status. If I find it's down, I will contact the sys-admins and have them do a reboot. So, since I get 200-300 hits a day, and if 10% of those hits tell me the server's down, that's at least 20-30 emails I have to sift through and reply why it went down. It's much easier to do one update to the Chronology section explaining the downtime, than returning 30 emails. Still working on small craft and stations/docks. I don't think anyone will be disappointed with what I come up with. Even I was surprised out how many such designs there were. Consequently, it has taken me longer than I previously estimated to complete these sections for the Federation, as well as the other races/organizations. Stay tuned, and PLEASE read the F.A.Q. It's been another long while, but I hope it was worth the wait. I've added the remaining set of ships from other races, and once again cleared my desk of pending federation starship designs. 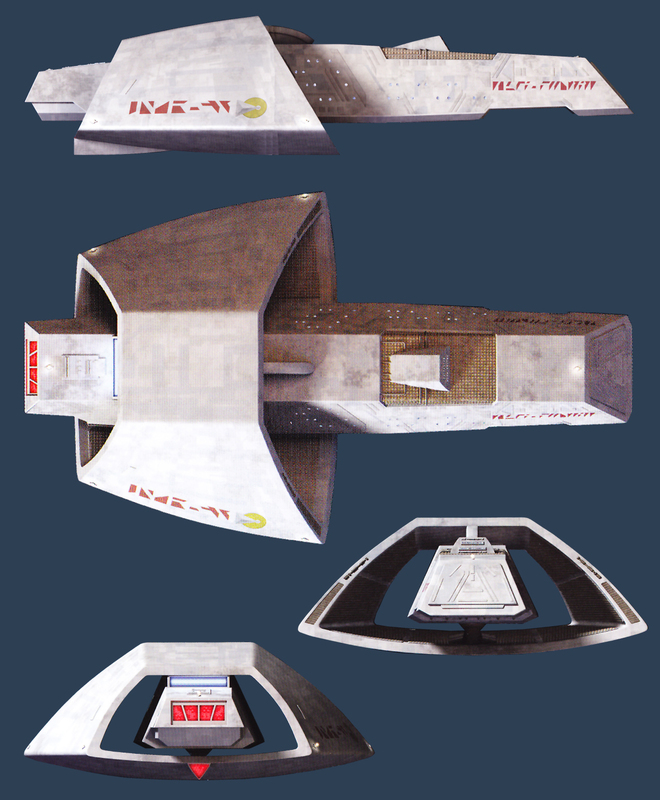 Updated Vreenak's Warpshuttle from the DS9 episode "In the Pale Moonlight" thanks to Rutger Warrink. Last but certainly not least, we have more miscellaneous vessels from the "Others" section that many people have been looking for, including the very elusive Peregrine-class fighter (which also happens to have been used as an Academy Flight Trainer - or at least so says the Star Trek Encyclopedia) and the extremely popular Jem'Hadar attack ship. In other news: This site has been nominated to be the Internet Collectibles Awards Star Trek Site of the Year. Cast your vote for this site! All help is appreciated - I know I have the users to make a serious dent in their voting poll. Also! I now set out to do what many people have asked me in the past (and I'm finally getting around to doing it): I am now going to add small craft (i.e. shuttles, fighters, etc. 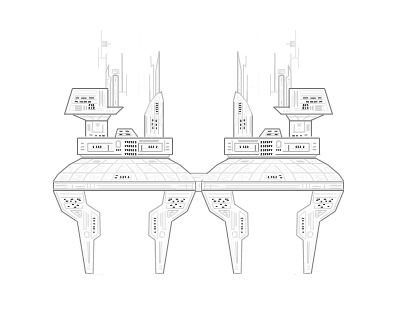 ), starbases, space stations, and drydocks to the Federation section (and continue to do so in the other sections). It will take me a while, so please don't send me emails asking where I am :-) Thanks, and I'll see you in a month or two. Had another bizarre hiccup with the Netscape server, but it seems to be functioning normally again. Anyway, added a couple new Federation designs including and featuring the U.S.S. Dauntless. Now, as we know (we, meaning those of us who saw the Voyager episode "Hope and Fear"), the Dauntless is not really a Federation Ship. It was built by one of the many wacko races bent on the destruction of Voyager for screwing up their planet, or whatever. 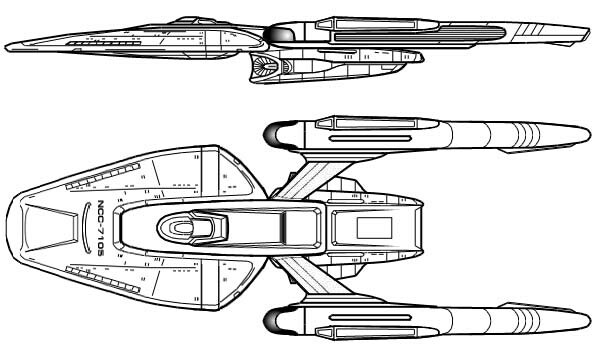 But, since the Dauntless was built with Starfleet ship design in mind (and since everyone has been screaming for this schematic), I have added it to the database with a small footnote in the entry saying "Non-Federation", classified as "Galaxy Exploration" (since it was ultimately designed to replace Voyager). 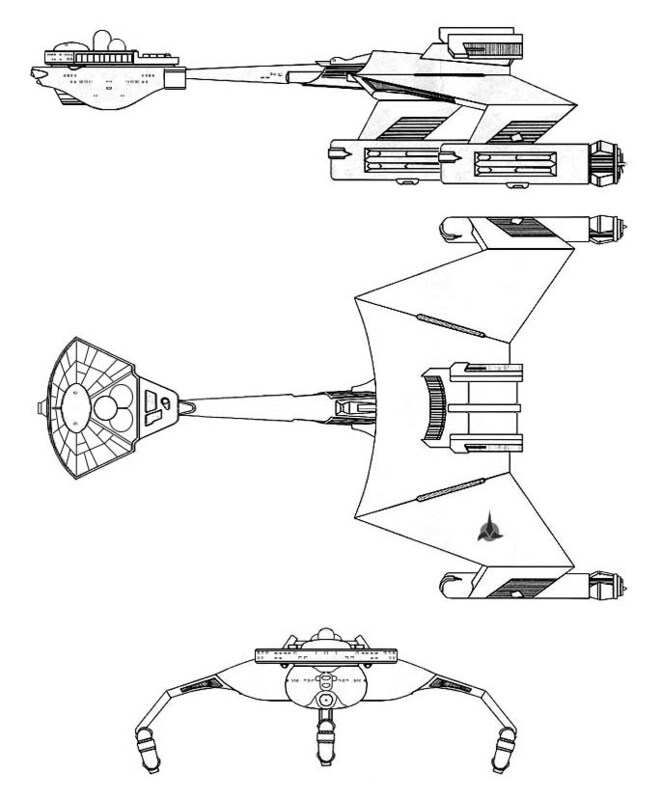 Also added the Romulan Warpshuttle from the DS9 Episode "In the Pale Moonlight". It is highly inaccurate, as there were very few views of this ship shown during that episode. I only hope that it shows up again later in the series - especially now that the Romulans have entered in the War against the Dominion. So, for what it's worth, here's the new Romulan shuttle - I was tempted to call it the Fett-class Warpshuttle, because of its cockpit design :-) NOTE: Found the true name of this warpshuttle. Refer to the 7/31/1998 Update for the info. The Cardassians have arrived in the Other Races section! Created two new significant additions to the database today. 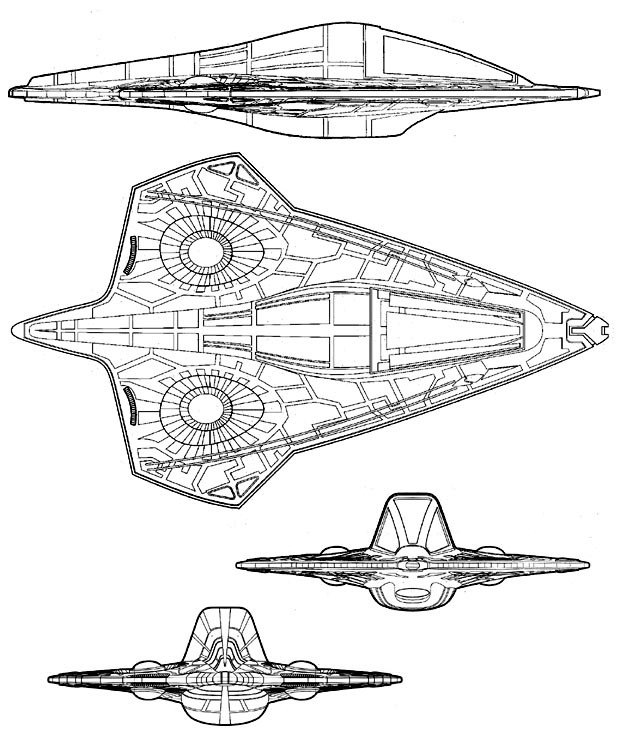 The first is the Goodson-class heavy cruiser; an interesting design, originating as a concept sketch from the producers of Star Trek: First Contact. As no ship name was associated with it, I christened her the U.S.S. Goodson, after her designer John Goodson. The second is a ship that many of us have seen recently: the Warship Voyager, as seen in the Star Trek: Voyager episode "Living Witness". As actual footage of the ship lasted for no more than 5-10 seconds (and a full view of the vessel was never shown), I tried my best to capture the extreme beweaponment that adorned this alternate-Voyager. I hope everyone approves. Broke 15000 hits! Another record! 1000 hits in 2 days. Someone just sent me the first email regarding the differences between Defiant and Valiant, in both my database, and in the show, as what I have in my database is clearly not what we saw in the recent DS9 episode "The Valiant". I will attempt to explain this difference as adequately as possible. 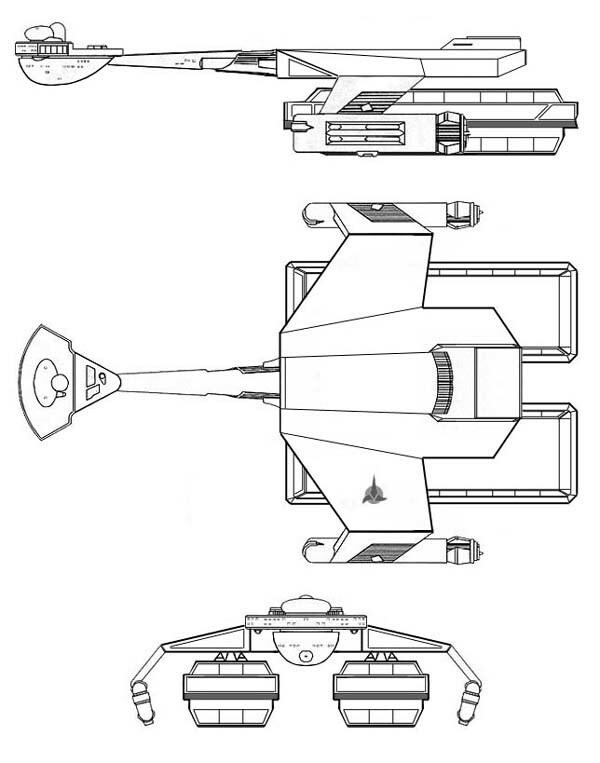 The "Valiant" I have in my database is, in fact, the prototype/conceptual design that eventually became to be known as the Defiant. 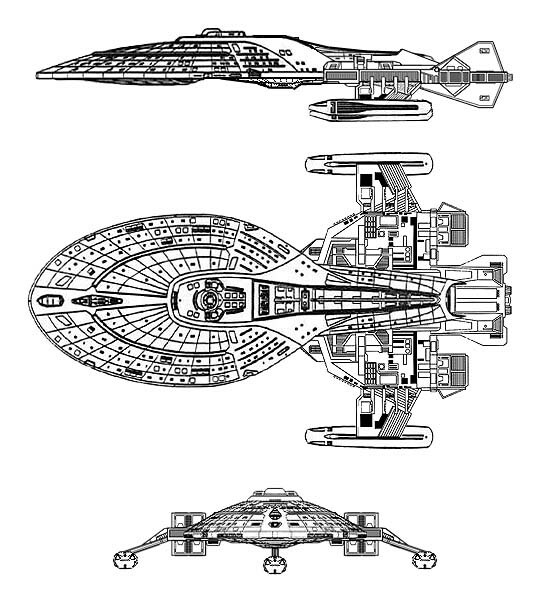 As a matter of fact, I had heard that the producers of the show unofficially called the Defiant a Valiant-class ship (or maybe the ship was originally supposed to be called the Valiant - I can't remember which). You can even see that older version of the Valiant on various schematics and "Okuda-grams" scattered here-and-there around the bridge of the Defiant (if you have a VCR with a good pause and a quick eye), no doubt because the bridge set was built before they finalized the starship design. Hope this helps people understand the difference. Added several new Federation, Klingon and Romulan Ships to the list and updated a few Federation Ships. Well, it's been a relaxing couple of months and the site broke 14,000 users in that time! AMAZING! But playtime is now over, and it's time to start catching up on some new business. Something new you may or may not notice, is the fact that all image filenames are now 32 characters in length. The reasons for this are two-fold... First: This allows Macintosh users (such as myself) to download the images, and not have to rename/truncate their names. Second, (and for COMPLETELY selfish reasons) it makes it easier for me to store the individual images on a Mac-formatted removable hard-drive for backup purposes, instead of hiding them all in one big, nebulous, difficult-to-access TAR file, that only a UNIX gnome would love. I have compiled a new group of submitted starships to be placed in the database sometime this weekend...more on that later. Happy Birthday to the site! As one of my users, Adam Heinbuch has pointed out, I began development on this site exactly one year ago today. 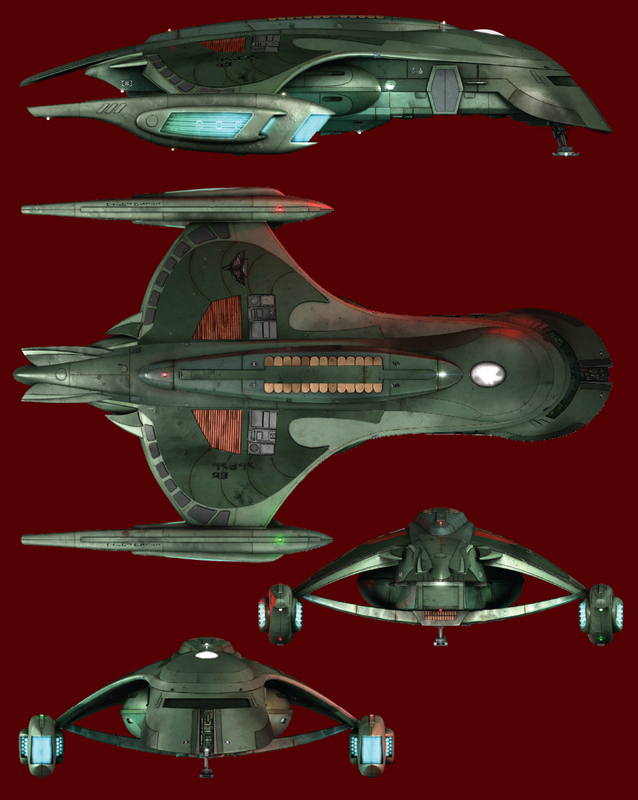 To celebrate, I have included the last of the major pieces of the site - the long-awaited ROMULANS! This particular section currently has 45 ships in it - mostly from the Romulan Ship Recognition Manual from FASA, interleaved with a few others. This should keep you users busy for a while, as I'm going to be a taking a LONG vacation from the site. I've been up until 3:00 in the morning for the past week cleaning out all the backed up files that people have been asking for along with building the Romulan section, so now I'm taking some time off. I will continue to accept any emails sent to me, and build up the queue once again for a future release - maybe a month or two from now. Until then, enjoy the new section. At last, I have cleared my "desk" of pending Federation designs...for now :-) I have three new ships, including Zefram Cochrane's Phoenix Warpship. 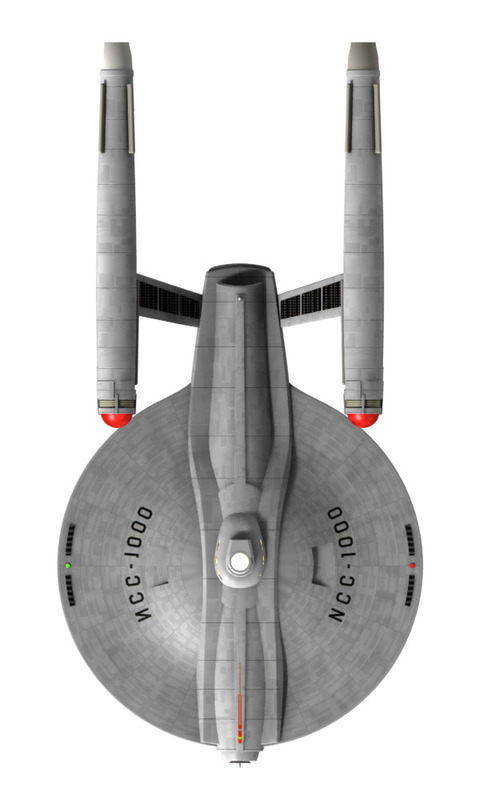 I figured that it was fitting to add the first warp vessel to ever precede the rest of the ships in my database, and the users were asking for it as well. It's the only Pre-Federation, Pre-UESPA ship in the database. Added YET EVEN MORE new Federation ships. Added graphics for the timeline search feature in the Federation section. Also received a few bits of email regarding the Yeager-class Scout. I've been told that the original version of the model did in fact have only two engines. I had mine with three. So, I removed the third engine from the Yeager, and created a new 3-engine variant - the Glenn-class Super Scout, just for completeness' sake. 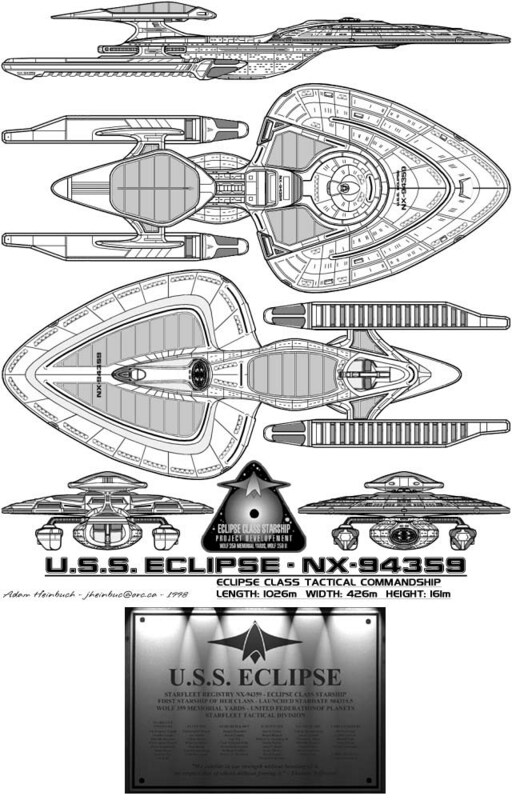 Also updated the Eclipse-class Tactical Command Cruiser to include front and bottom views. Also added some more of the "unofficially official" ships along with a bunch of submitted designs from P.T. Riley and other users of the site. Also added some new official and non-official designs and made accurization updates to various ships. DISCLAIMER: To the designers that apply: Some of the designs above have John Gurzick's name attached to them for no other reason than he was the one that brought them to me. This in no way implies that he was the original designer of said designs - he just didn't have any source info on some of the ships he sent me. This is in no way meant to be a slight towards either the original designers OR John. I appreciate all submissions sent, and I want to make sure that everyone is appropriately credited, the best I can. Had a slight glitch w/ the server. Some of you who tried pinging the site today may have gotten an "Access Forbidden" error. I contacted the system administrators and all it needed was a restart. Everything seems to be running fine now (as of 15:20, EST). Sorry about the downtime, but it does happen occasionally. Well, after a month-long hiatus, I've started up production again, with one major change, and a minor one. First, the major change: You might now notice, in the Federation section, that there is an extra column for each ship. This denotes the Era in which each ship has appeared (for official designs), or is likely to have appeared (for non-official designs). For ships that look as if they were built before the timeframe of The Original Series. For ships that look as if they were built during The Original Series. This also includes The Animated Series. For ships that look as if they were built during The Movies (from Star Trek: The Motion Picture to Star Trek VII: Generations). Only official ships will have multiple entries, as we see ships like the Mirandas, Excelsiors, Oberths, etc. appearing as early as the movies to as late as Next Gen, DS9, and beyond. The time period to which unofficial ships belong is largely determined by the latest piece of technology shown on the vessel. By "latest piece", I mean that there are some designs which are made up of components of ships which span timelines. For example, the U.S.S. 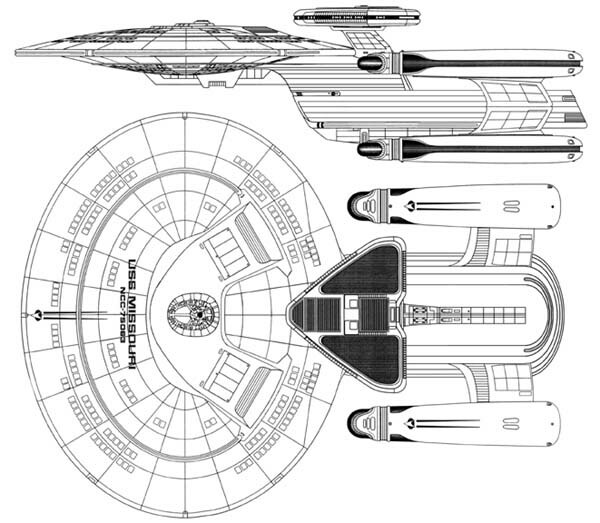 Alliance-class dreadnaught is largely a Movie-era starship, based on the Enterprise-B. 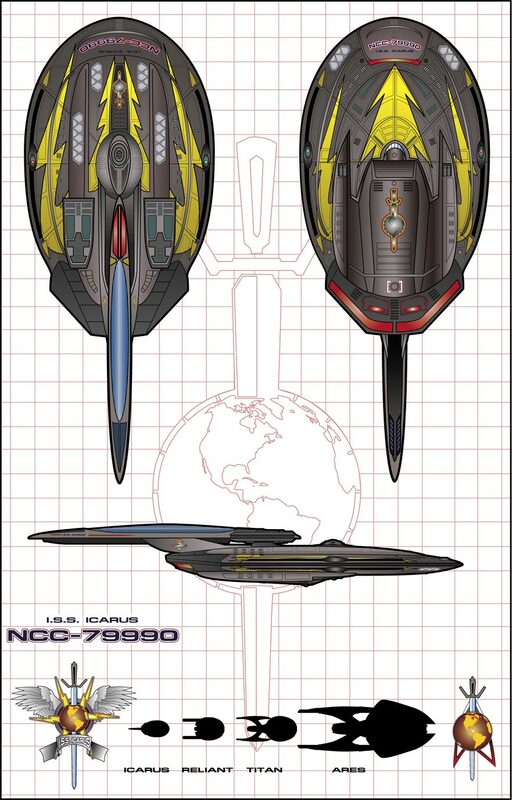 However, the Alliance also happens to have a Nebula-style weapons pod, which is obviously a TNG-era design. Since that pod does not exist in Movie-era time, we assume that the Alliance was a ship built during the time of TNG. Many thanks to Gregory Bain for this great idea. A graphical timeline in the main Federation section will be installed to help facilitate this new functionality. 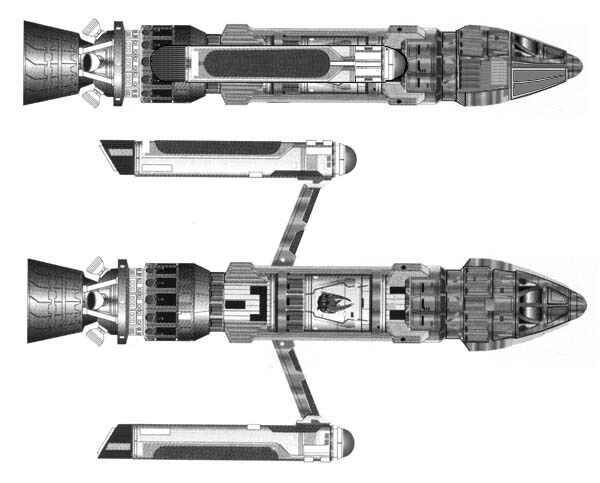 And last, but certainly not least, the small but significant change: With the help of John Gurzick, I've found that the previously-unknown thru-deck carrier, as seen in the DS9 episode "A Time to Stand", belongs to the Shelley-class, and is now listed as being in the TNG era, and Movie era (for of its use of Miranda and early Star Trek III-variant Excelsior parts). Added a new section: It's entitled References, Reviews and Awards. I've been getting some emails from various organizations wanting to add links to this site, review it and nominate it for awards. So, in preparation for the future, I have added this particular section to accommodate this new (and hopefully growing) aspect of the Schematics Page. The first thing you may have noticed when linking to this site is my new membership in the Starship Design WebRing, consisting of other pages dedicated to the pursuit of schematics. The other prominent addition thus far is a link to One Click Away Online Magazine, which has added a link to this site in the CelebritySurf section. Added some new ships and updated a few others. Hey, all. I'm going to get on my soapbox a little. I just got back from a grueling weekend at a World War II re-enactment at Fort Indiantown Gap, Pennsylvania, only to find this flurry of emails telling me of an individual who took a copy of the Prometheus schematics I drew, and resubmitted it to another web site claiming it to be his. As I progressed through the emails I received that weekend, I found that the situation had pretty much resolved itself, with the guilty party admitting the plagiarism. I think I found this activity on the part of this individual somewhat disturbing. Aren't we trying to prove to the Paramount/ViaCom juggernaut that we fans of the Trek Universe are not a bunch of stealing, lying bastards claiming other's work as our own? Must we have people out there proving their case for them?!? I have NO problem with people taking images from my site and republishing them AS LONG AS THEY GIVE CREDIT WHERE CREDIT IS DUE!! I went to great lengths to make my bibliography section as up-to-date and complete as possible, siting all credits (where available). I expect no less from anyone else who chooses to use data from this database. I'm going to come off my soapbox now, but not before thanking the users of this site who brought this to my attention, as well as the site managers of the web pages where my Prometheus schematic wound up, for lack of a better word, illegally. All people involved acted in an extremely professional manner, and took care of the problem without the need for me to get involved. Thanks to all those watching my back. It is appreciated. And to that person who took that image, you know who you are, as do I and several others. Maybe you should try getting hired by ViaCom to shut down all the non-official, non-MicroSoft Star Trek sites, you're doing such a good job of proving their argument, already. The battle continues! Many people have mailed in to me siting possible updates to the U.S.S. Prometheus, to assist in its accurization; some suggestions I have taken into account and altered the design accordingly. Since it is the newest official ship to-date, I will examine each idea on how to improve on the existing design, until an official source (book, CD, person, or otherwise) can concur or negate said changes. A lot of buzz has been generated on this one, and I'd like to get it as accurate as possible. Thanks to all those who have contributed to the continuing improvement of the site. I'm currently getting on the average of ten emails per day (the record so far being thirteen). Keep it coming! Added the U.S.S. Prometheus today, along with a few other ships to the Federation database. 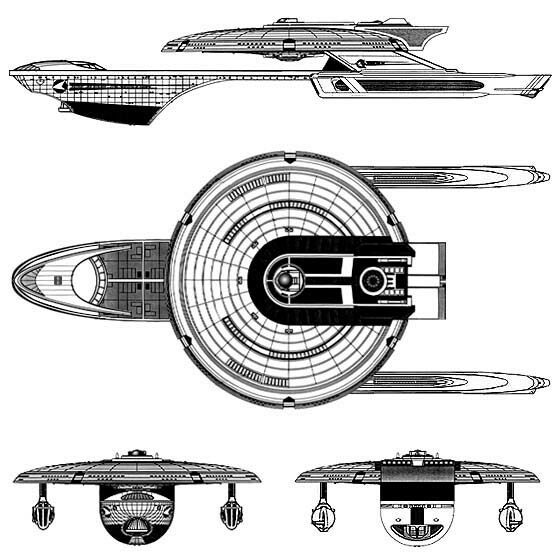 was redefined to be an Excelsior class ship in the DS9 pilot. modified again with the wedge array replacing the AWACS dish. 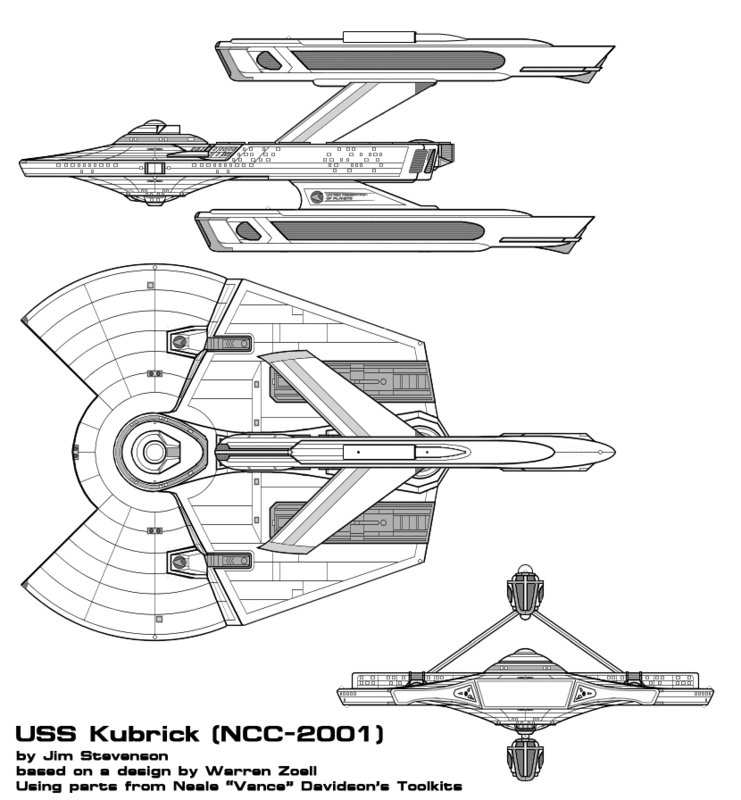 Keeping this information in mind, I'm now changing the unknown tactical cruiser to be the U.S.S. Melbourne. Even though the name is unofficial, the design is, so I will keep it official for now, until a new name can be obtained for this ship. Thanks, Marcus. I have also added a few new sites to the Associated Links Section. Whew! Had a minor crisis there for a little bit. I received a few emails saying that a bunch of the Klingon ship images were corrupt. Lo and behold, they were! As it turns out, the server that this page is running on had a problem with its Uninterruptible Power Supply (UPS), causing a spike on the system, frying some data on a certain part of the disk. Lucky me - that's where most of the Klingon designs were stored, along with a few of the newer and updated Federation and Alternate Universe designs. I think I have it under control - I rebuilt the entire Klingon section, and replaced select Fed files - we should be up and running now. We are now up again - 4 days ahead of schedule! Schematics site goes down temporarily for maintenance and investigation of corrupted image files at the server level. It has come to my attention that there has been some confusion over what exactly is in this database, and what makes an appropriate string to search on in the Federation section. I have added some information on these questions in the FAQ. Check it out, and hopefully there will be no further problems. The Borg are now in place in the Other Races section! Also added a few more Federation and Klingon ships, including yet a few more unknown ones (all Klingon). 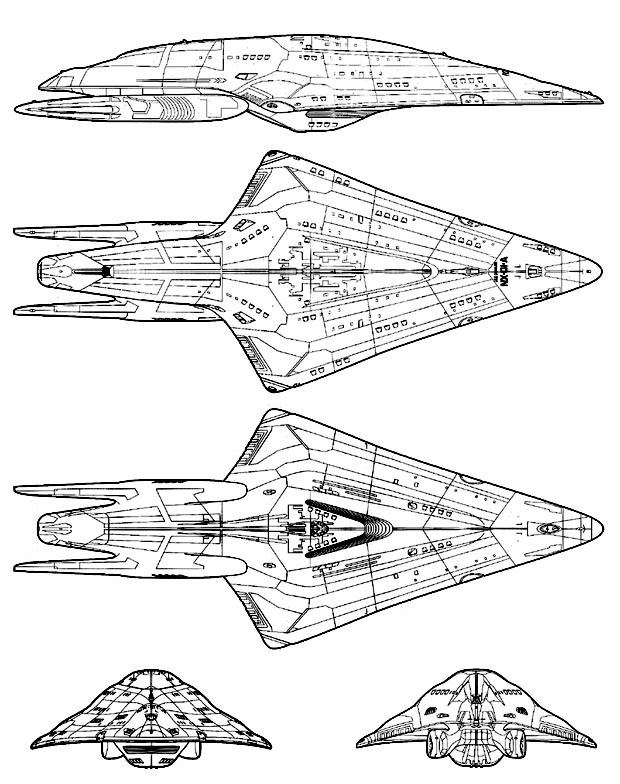 All but one of these unknown designs come from "The U.S.S. Enterprise Officer's Manual", a grey/white/red-looking fan-published book, which had some good stuff on the early series, including the first-ever known printing of the "Klinzhai"-variant of the Klingon Language. The second unknown Destroyer is a design by Mateen Greenway. (Small Change) Greenway's ship name now listed. Happy New Year all! Lots of good new stuff in the site. I've been working for the past couple of weeks (during my holiday break) to build the new Klingon Section, and now it's finally done! You might notice a significant change on the main page as well: I've consolidated all the "minor" races (including Alternate Universes) into an all-encompassing "Other Races" page. Since there aren't many designs for any of the races, other than the Federation, Klingons and Romulans, I didn't see the need to dedicate individual pages to them. It got a little too cluttered. 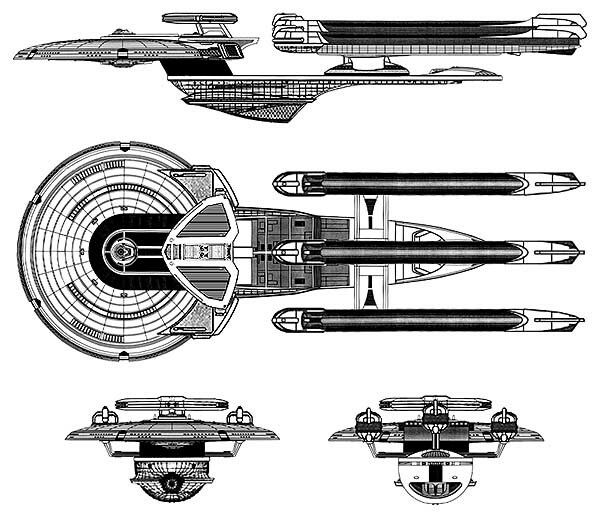 The first thing you see when you get in there will be the Alternate Universe vessels, that I've always had in my list. I've also added the Maquis Raider to the Maquis section further down. In other news, this site has recently been added to various search engines, such as Alta Vista, Yahoo!, and InfoSeek. Rebuilt the General Bibliography so that it appears in some semblance of order. Updated the Yeager-class scout to remove the third warp nacelle to make it more accurate to the actual miniature (thanks, Adam). Added a few more new ships. Updated the F.A.Q. 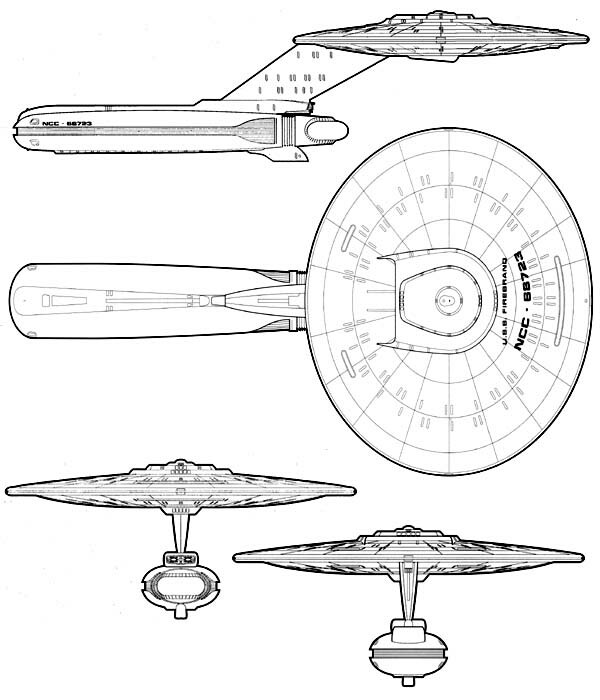 to include information about what makes an "official" design (straight from the mouth of the Great Bird of the Galaxy himself, Gene Roddenberry), whether or not these schematics are in scale with each other, and if I plan on including schematics from other genres. Began work on Klingon and Maquis sections of this site. Added new Associated Links section for the various internet-related sources that were instrumental in the construction of this site and its database. Updated some ships to accommodate a higher level of accuracy. 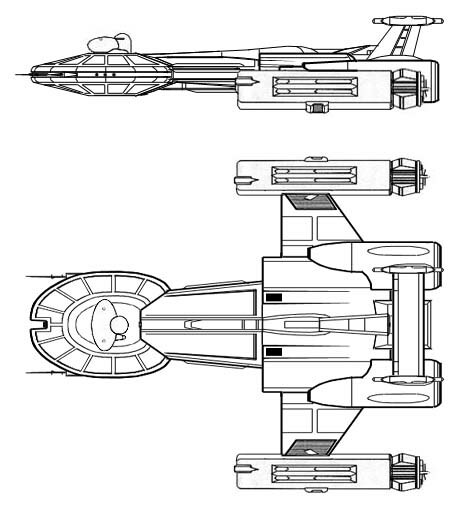 Added new entries for Federation ships including the official design for the Yeager-class Scout. 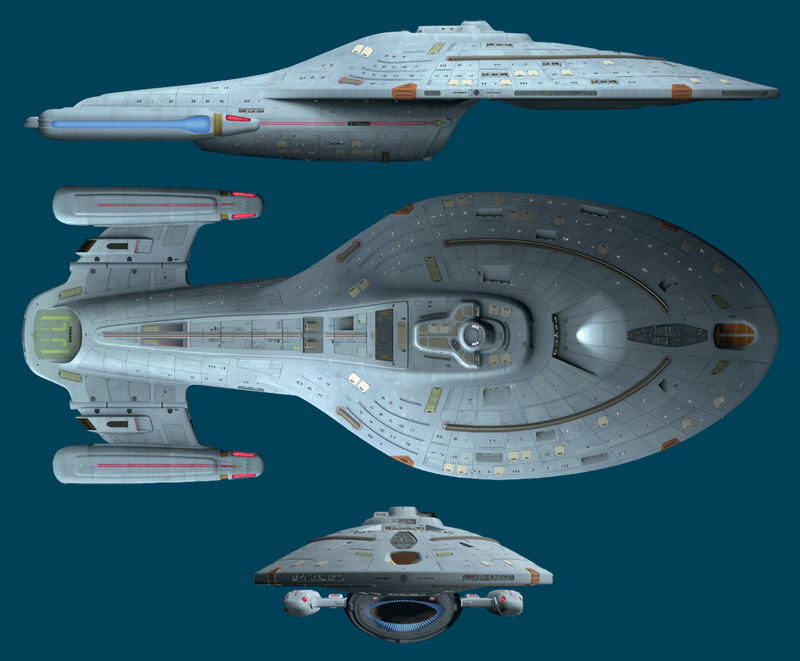 NOTE: The Yeager-class Scout is considered official, as it can be seen occasionally orbiting Deep Space Nine. Not much is known about this one, other than its mere existence. 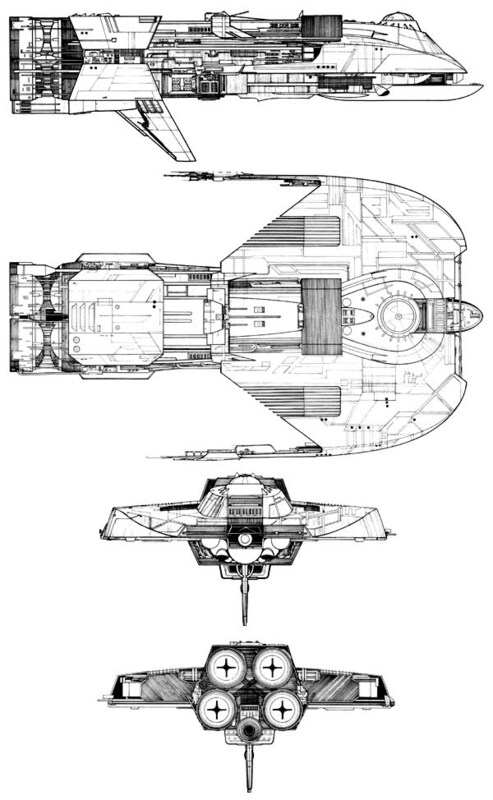 We assume that it appeared sometime during DS9's late fourth season through fifth season, as that was when Star Trek: Voyager went on the air, since the Yeager appears to be made up of components from both USS Voyager and the Maquis Raider. Updated Bibliography section to be more functional and user-friendly. Updated some bibliography data as well. Added two new "official" ships: The U.S.S. Centaur frigate, and the U.S.S. Shelley thru-deck carrier from the Star Trek: Deep Space Nine Season VI premiere "A Time to Stand". Page is enlarged with place holders for ships of other races, including Klingons, Romulans, Cardassians, Bajorans, Borg, Ferengi, Maquis, Dominion, and Kazon. Research is in the works to update the Federation section, and newly populate the Klingon section. Chronology section is added, along with new race logos - Maquis, Dominion, and Kazon. Tal Shiar and Obsidian Order Logos incorporated into the Romulan and Cardassian sections, respectively. 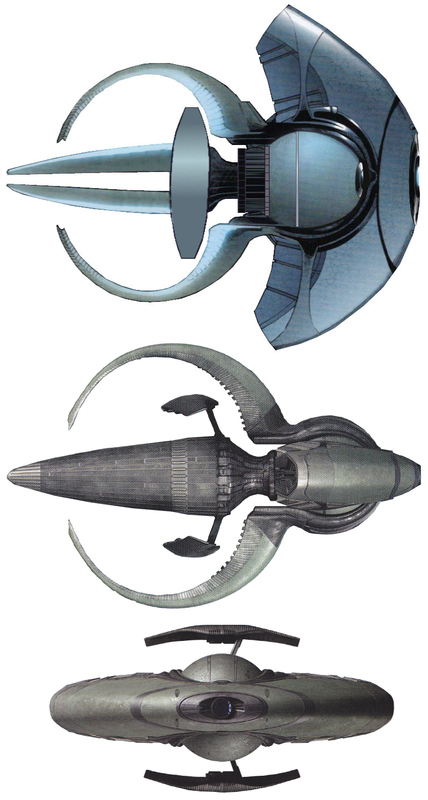 Federation First Contact section will now also include the latest starship designs from Star Trek: Deep Space Nine. A little "hickup" with the server forces a reboot. CGI scripts begin functioning consistently at this point. 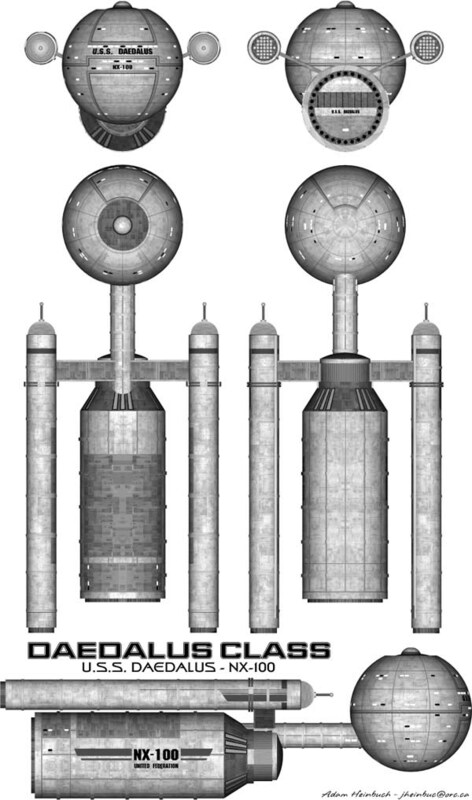 The Starship Schematics Site goes online at 22:29 hours EST. The Starship Schematics Site development officially comes underway with the scanning in of over 100 individual blueprint sets and printed schematics.